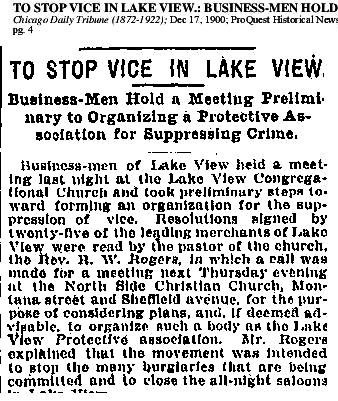 1) The Lake View Maennerchor was organized in October 1881; its present officers being Otto Ernst president, G. Sceffker vice president, William Smiffker corresponding secretary, William Bloom financial secretary, Christian Gall archivist, and Emil Zott musical director. 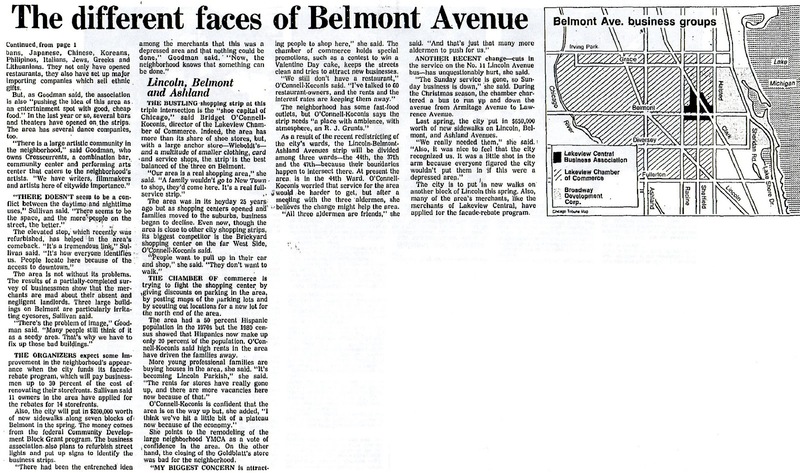 The society numbers thirty six active members its headquarters being on the corner of Sheffield and Belmont Avenues. 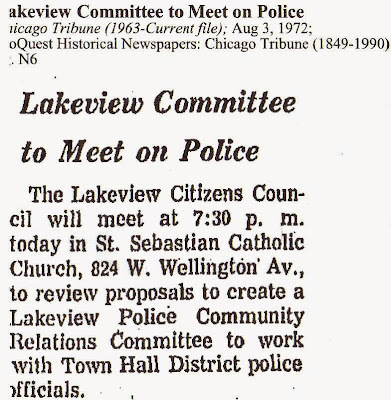 2) The Lake View Citizens Association District No 1 was organized March 15 1879 with the following officers R.S. Andrews president, M Kunkel vice president, G.W. 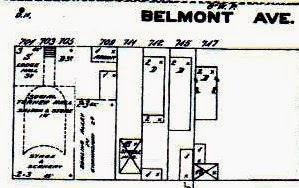 Barnett secretary, A.S. Maltman treasurer. 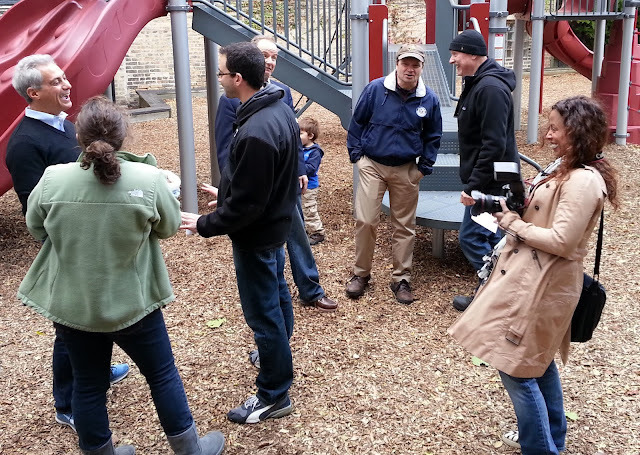 Its present officers are A.S. Maltman president, Robert Griffith vice president, EH Griggs secretary, and M Kunkel treasurer. The object of the association is to promote public improvements in the Town[ship] of Lake View in general and District No 1; in particular regular meetings held monthly at Lake View Music Hall [at the] corner of Lincoln and Sheffield Avenues. 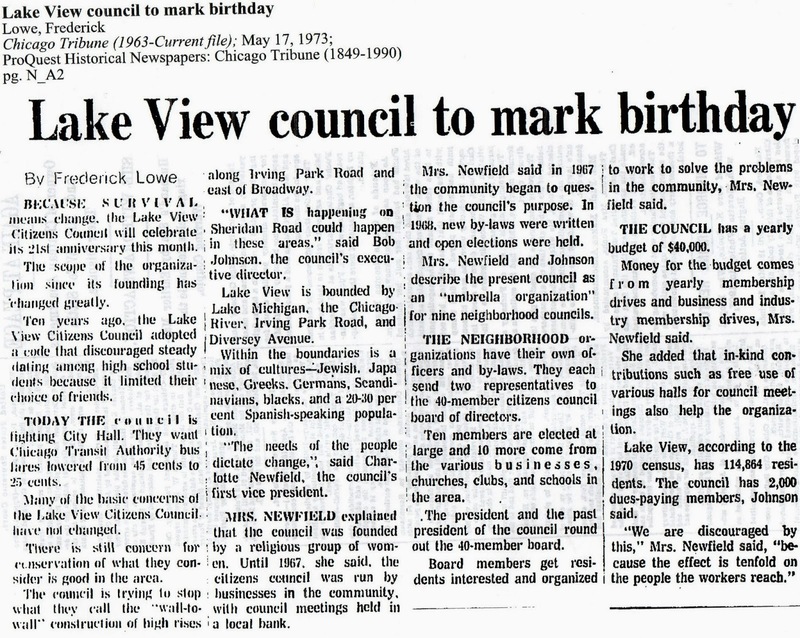 3) Lake View Lodge K of H [number] 2,929 was organized March 27 I883 with eighteen members. 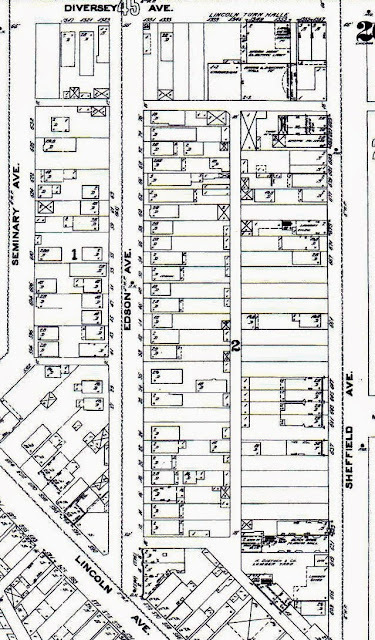 At present the Lodge numbers thirty five members. 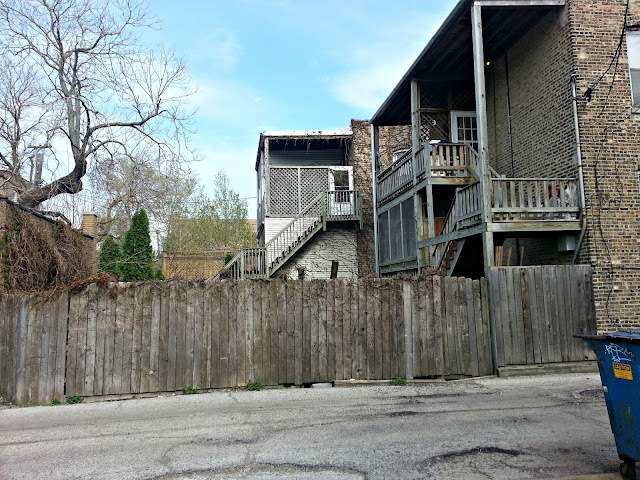 The Lodge meets every Friday evening at Klatt's Hall No 1698 Clark Street (pre 1909 address). 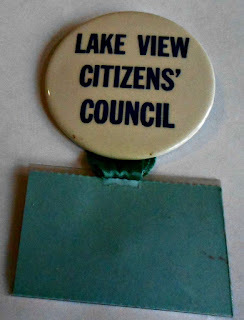 4) Lake View Council Royal Arcanum No. 694 was organized on July I3 1882 with fifteen charter members..The Lodge numbers at present thirty-one members. 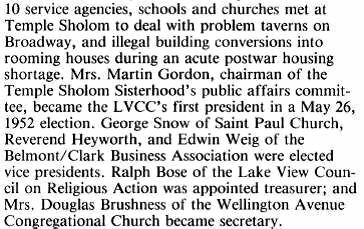 Deering Lodge No. 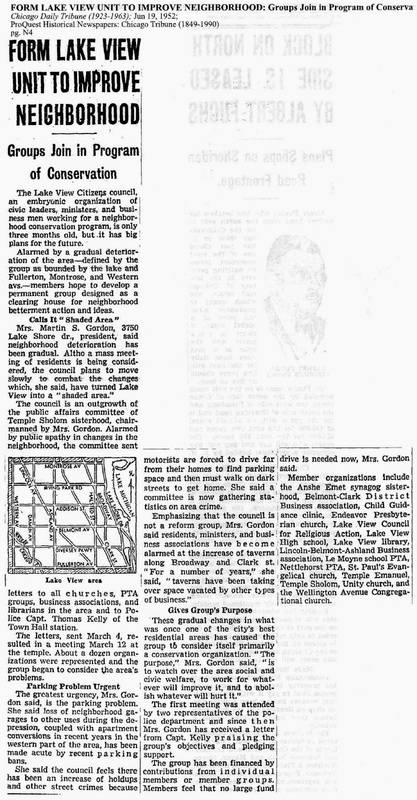 7I7 was instituted August 21 I882 with fourteen charter members. 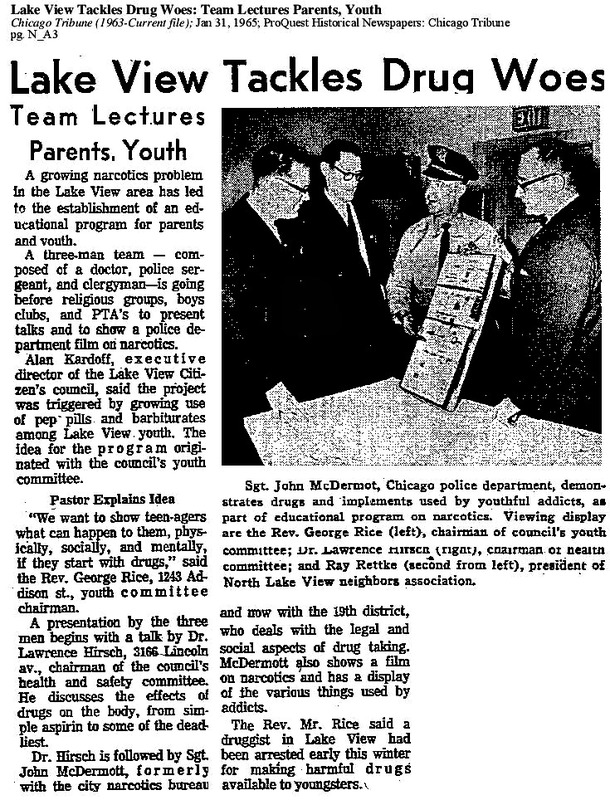 5) The Lake View Sons of Temperance Division No. 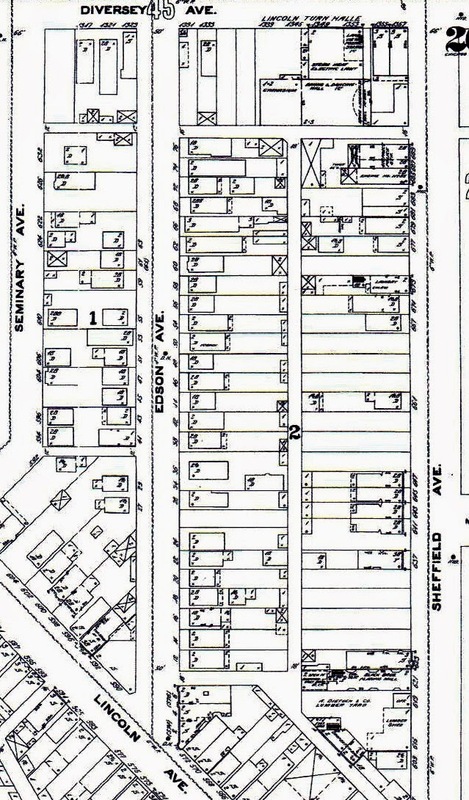 87 was organized in the fall of 1881. 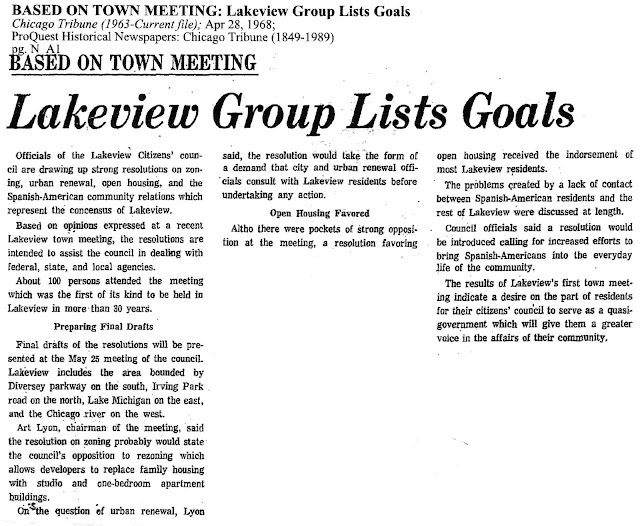 It now has fifty members and meets in the Lake View Music Hall. Other societies of Lake View worthy of being mentioned are Wrightwood Council No. 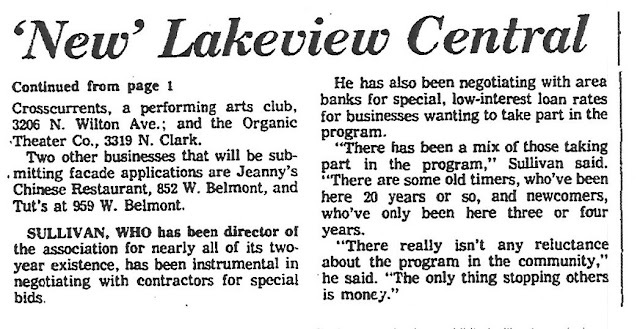 756, Royal Arcanum,The Lake View Club,The Lake Shore Club,The Lake Side Rifle Club, and a new literary society in which the moving spirit is Frank Jewett. 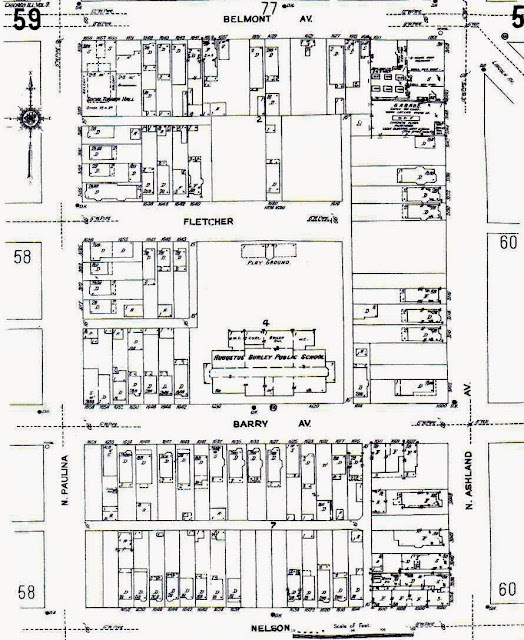 In February 1884 [This organization had] a brass band of fifteen pieces organized at Rose Hill under the leadership of Professor Prior of Evanston [Township]. 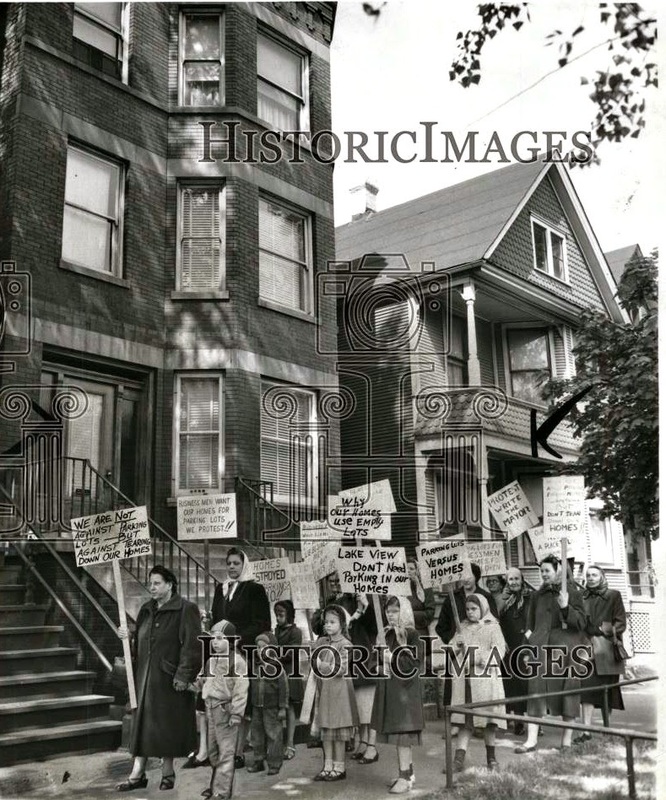 In 1948 The Houses of Worship Unite! 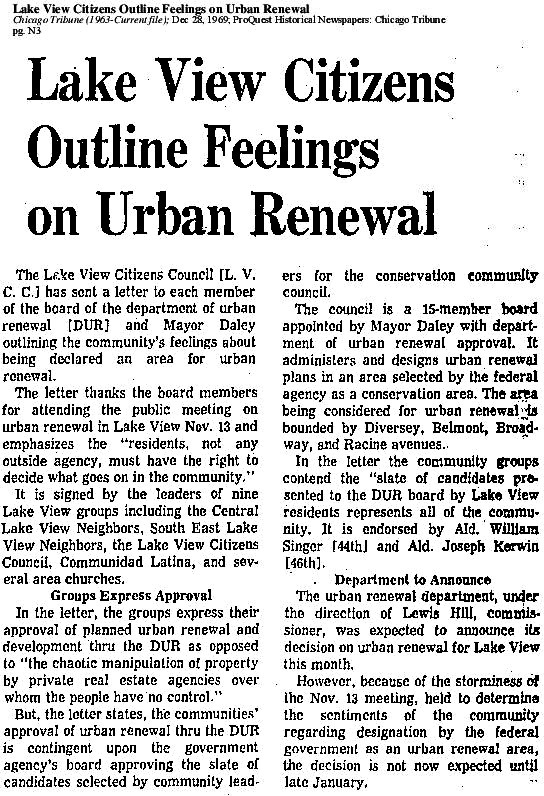 This section of blog post is devoted to an organization that I believe had a direct influence to the vitality of Lake View Citizens Council - The Turnverien. 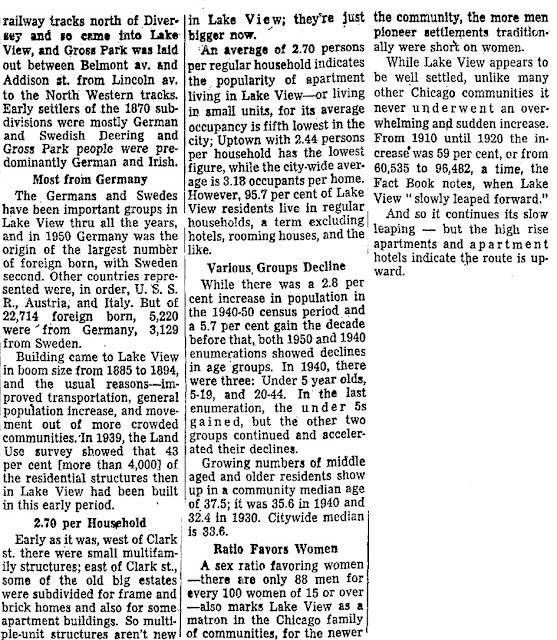 The German speaking populations of the 19th and early 20th century had strong presence in shaping social and political events in Chicago not only because of its' vast migration numbers but for the strong and countless organizations and that they established either in Europe or in Chicago. 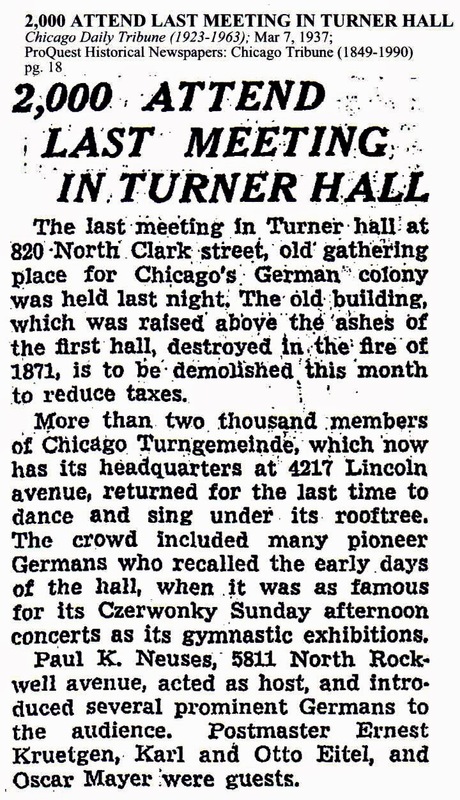 One such organization that was established in Europe and continued in Chicago was the Turnverein or to be referred by the press as the Social Turners. 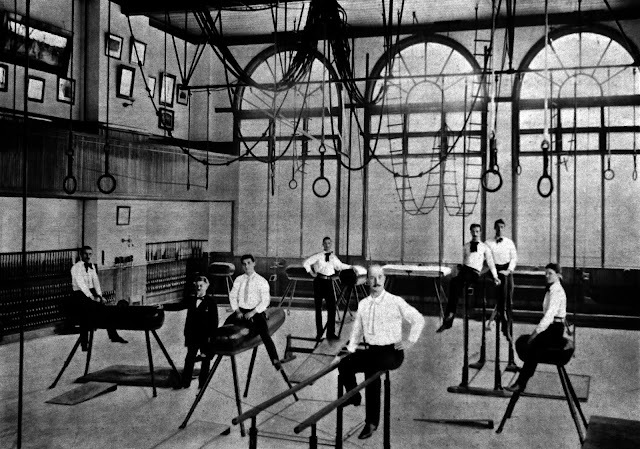 The Turnverein movement began in mid 18th century central German Europe due to new enlightened realization of Europeans of individualism, equality, and independence. The Germans in the 1840’s suffered with disease and poverty during this time period along with corrupt nobility that governed small principalities through-out German Europe. 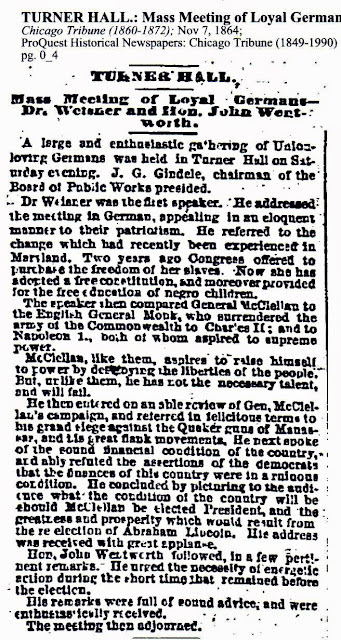 The 1848 revolution in Europe dotted the continent with uprising against the monarchies of Europe that included German Europe. An organization was established just before the failed attempt of the 1848 German revolution was the Turnverein. After the failed revolution many dishearten German speaking peoples of Europe fled to United States taking with them the principles of the Turnverein – basically the education of a strong mind, body, and soul in the form of gymnastics in order to created a strong nationalistic solidarity or resound and respectful German entity in America. 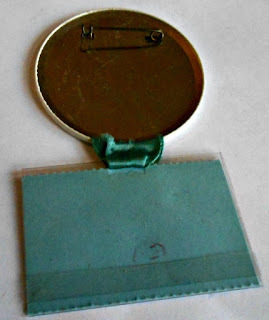 Most Germans including the members of the Turnverein believed in a national, independent and united country where by each citizen would be respected and educated. 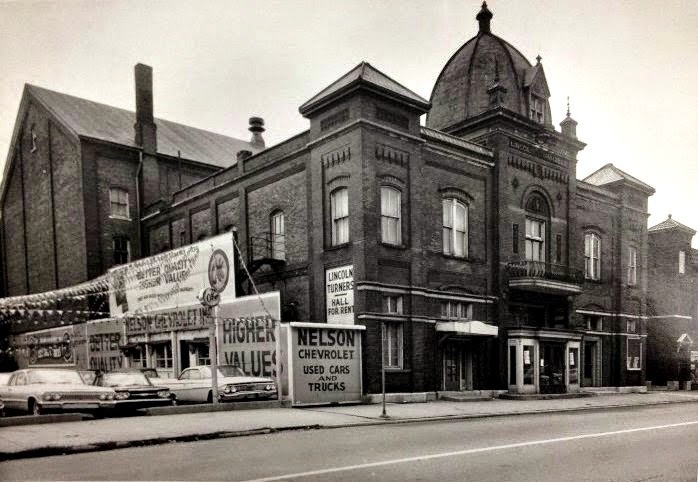 The Turnverein believed in the 'dignity of the individual' so by the 1860’s most Germans and ‘Turners’ were Lincoln Republicans and joined the Union army. The State of Illinois contributed the most of any other state in the Union. 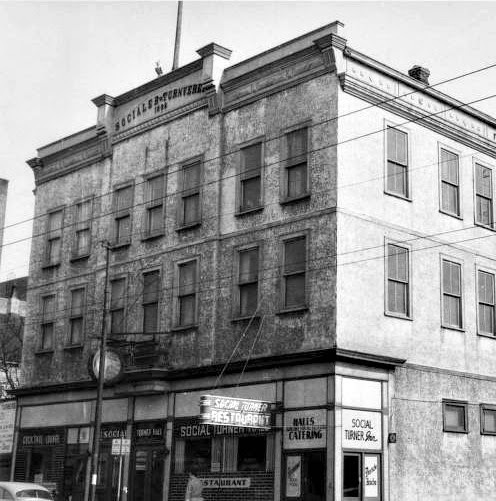 The Turnverein or Social Turners constructed multi-purpose buildings for their organizations. 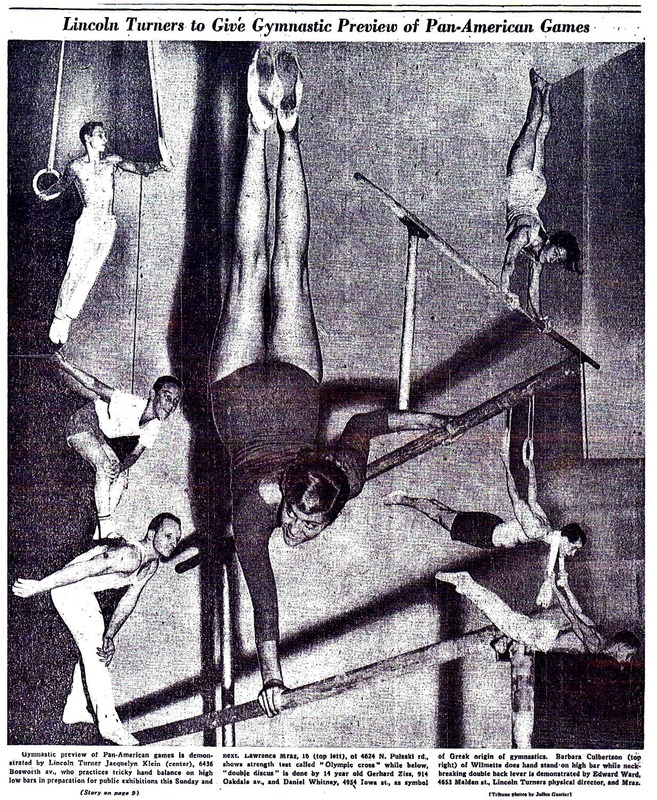 These ‘halls’ were not only a place of Olympic style gymnastics but social hangouts for political and labor movement meetings and gatherings. 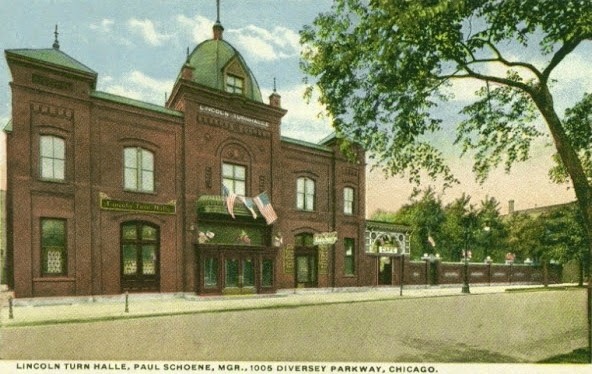 They had beer halls and beer gardens for those folks who only spoke German - (more than likely having a beer after a good work-out). In these ‘halls’ they would speak about their homeland but more importantly, and much like today, speak of a poor education system, poor working conditions, and corrupt politicians of their local area. The ‘halls’ in the late 19th century were either conservative or socialist but all were united in the believe that a strong mind, body, and soul though gymnastics created a better citizen much the Greek philosophy of Aristotle. By 1887 this organization had six sub-societies in Chicago and Lake View Township. 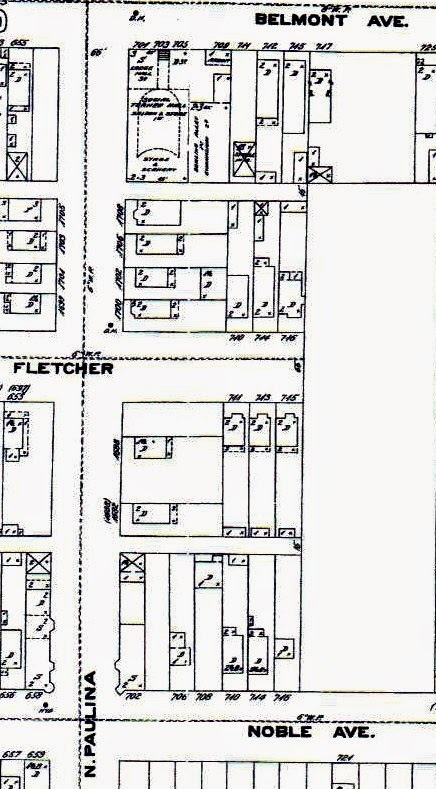 Due to the Chicago Fire of 1871 the Turners moved their main headquarters to 4217 Lincoln Avenue. 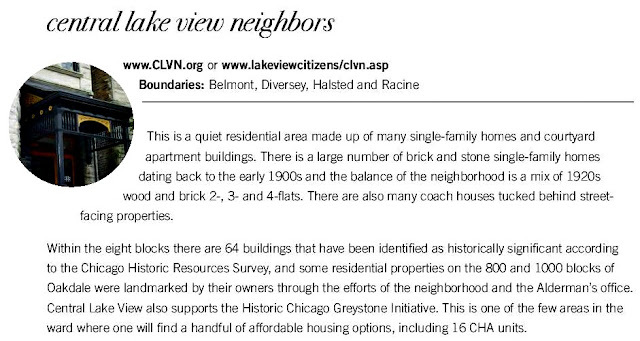 There would be several Turner Halls in old Lake View - most notably on Belmont, Paulina and Diversey and Sheffield. 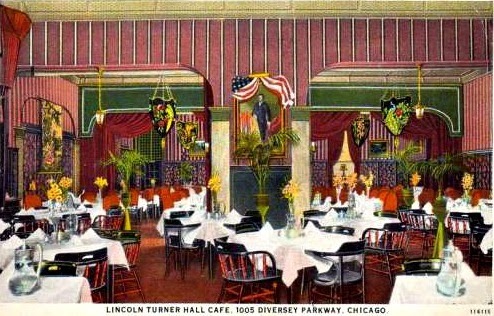 Only one Turner Hall building remains – the Lincoln Park Athletic Club on Diversey. 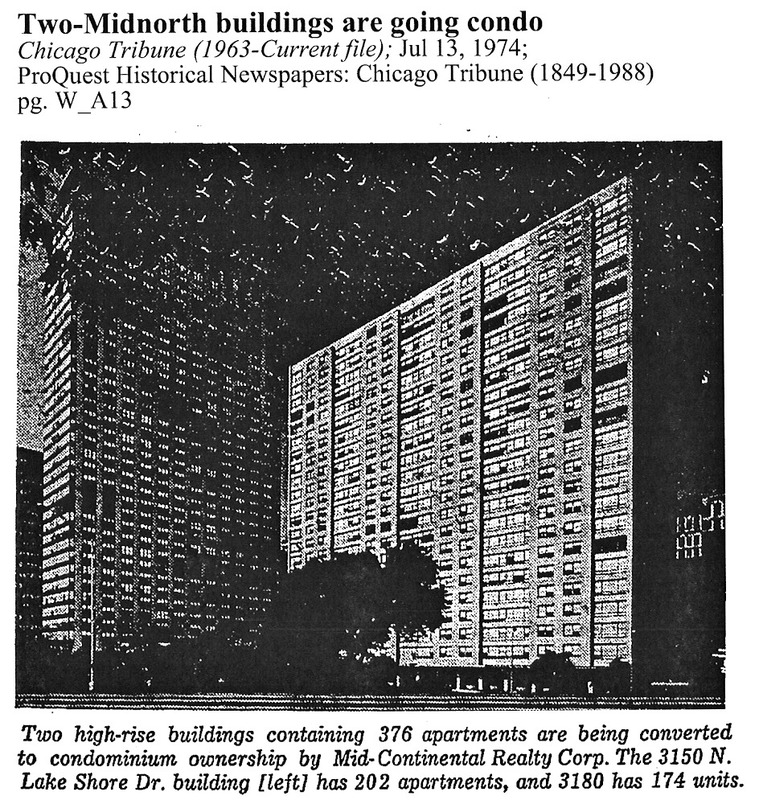 Note: Karl and Otto Eitel were owners of the Bismarck Gardens while still in ownership of the Bismarck Hotel located in the loop area by 1937. 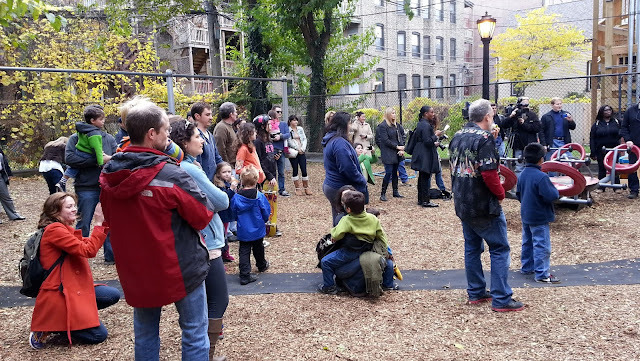 (merged sub-associations/societies at various dates) moved to suburban Schiller Park where mission & philosophy continues with the operation of gymnastics and social programs to all ethnic groups. 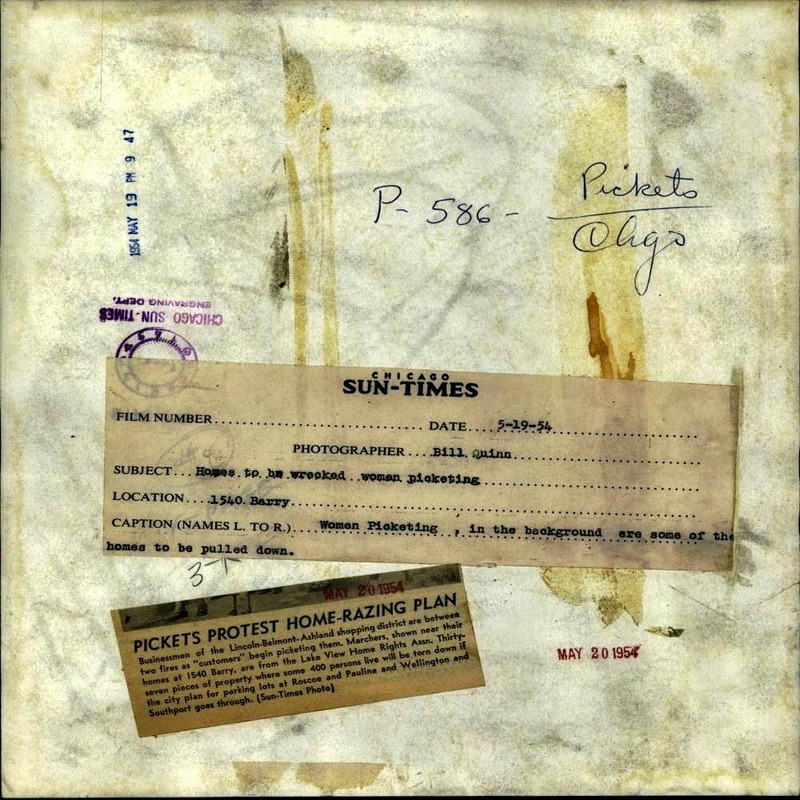 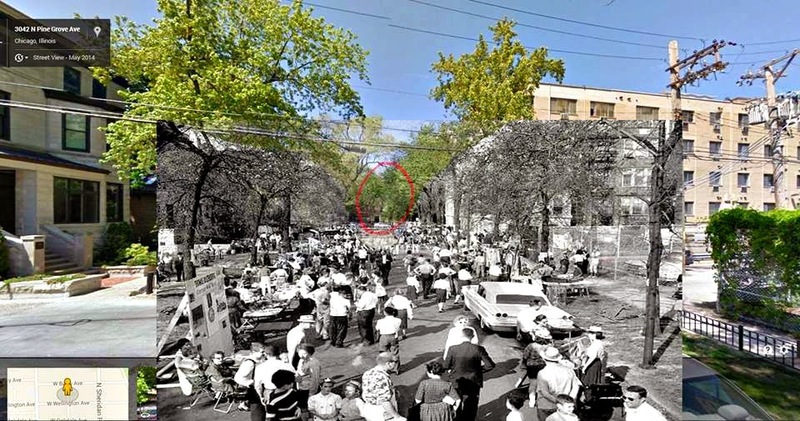 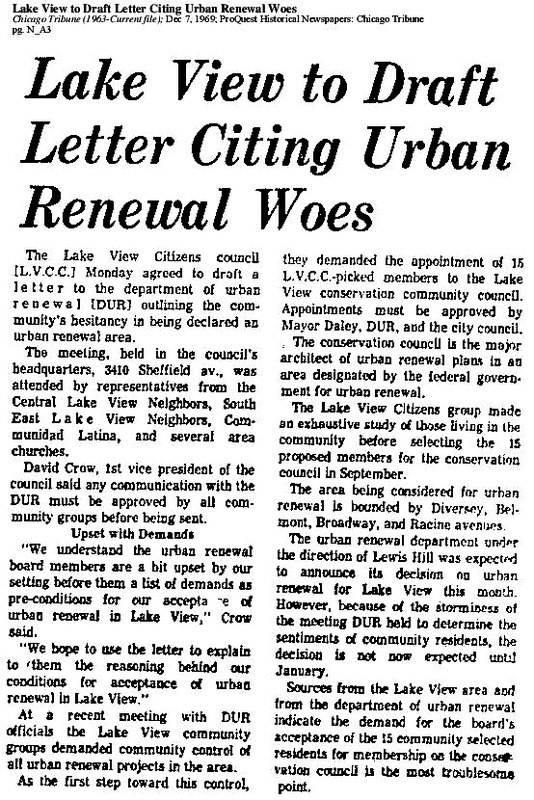 While the city reorganized into official neighborhoods by 1930 citizens began in earnest to organize into civic groups by 1950's that was mostly due to change in the economic and social fabric of the city in general and neighborhood of Lake View in particular. 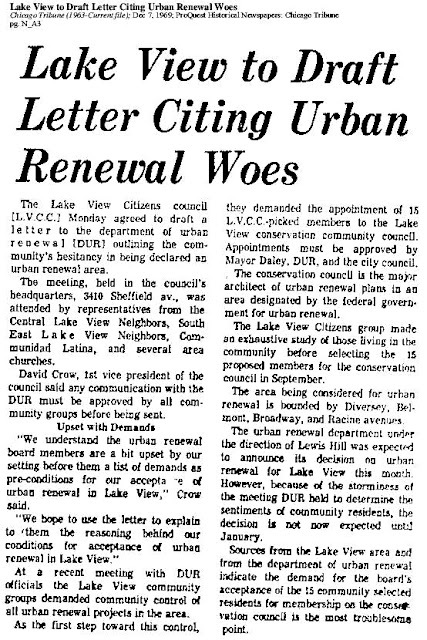 While the citizens of Lake View had ad hoc associations and clubs prior to 1952 the LVCC became a permanent citizen advisory organization to this day. 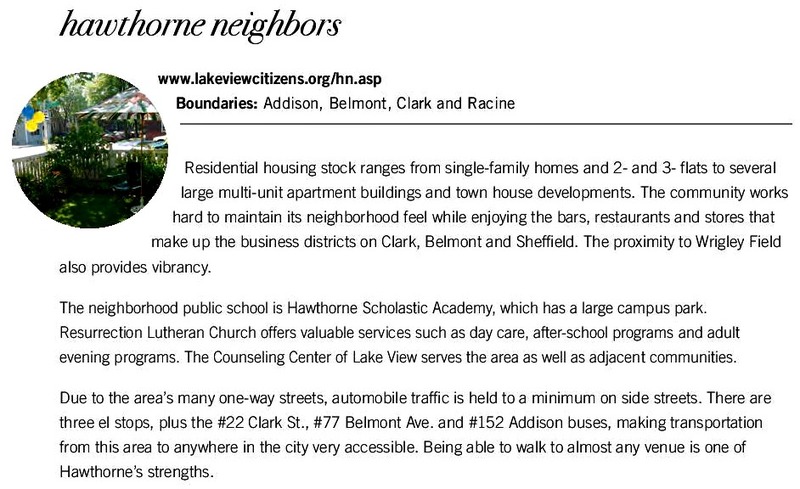 The Lake View Citizens' Council (LVCC) is a non-profit civic organization serving the Lake View neighborhood. Eleven sub-neighborhood or local community associations presently form the LVCC. The council was formed in 1952 to counteract the expansion of residential apartments called 4+1’s that were built though the 1950's, unruly taverns on Broadway,in the 1970's acted as a safeguard against historical building displacement as well as manage the influx of different cultures that took root in the neighborhood. A publication called The Politics of Place: History of Zoning in Chicago - Chapter 4 is a great read on zoning particularly on the subject of 4+1's in Lake View. 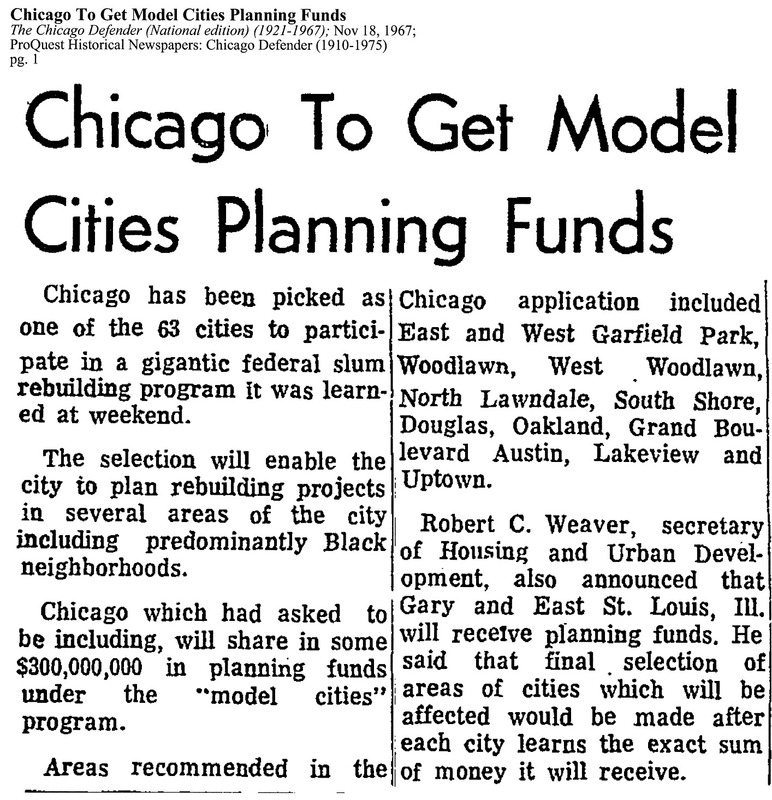 Civic groups regarded the buildings as islands of urban ghettos replacing a smaller apartment buildings, older homes and mansions. 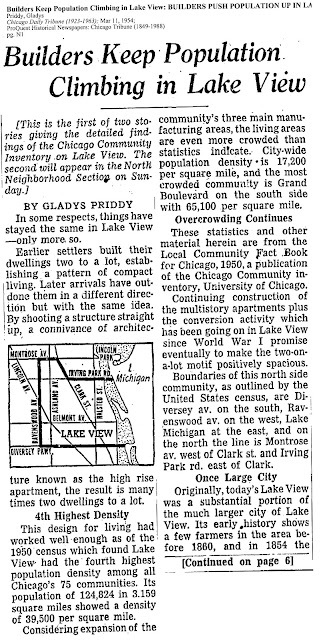 By the mid 1970's most 4+1's were located in Lake View, Rogers Park, and Edgewater. 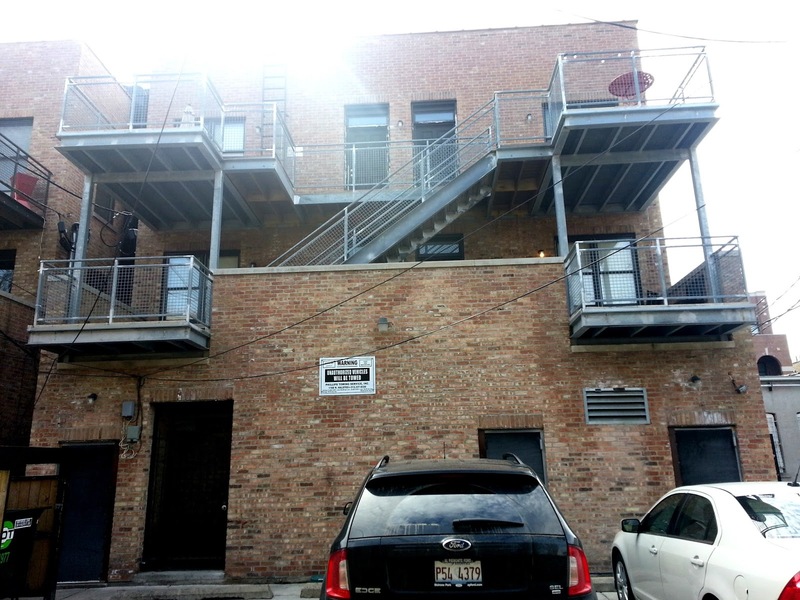 Here is an inside & modern view of a 4+1 today by Yo Chicago; they did a good job of describing the features of this type of building that were meant for the 'working poor'. By 1960, 13% of housing units were owner-occupied; 52% of residents lived in buildings with 10 or more units. 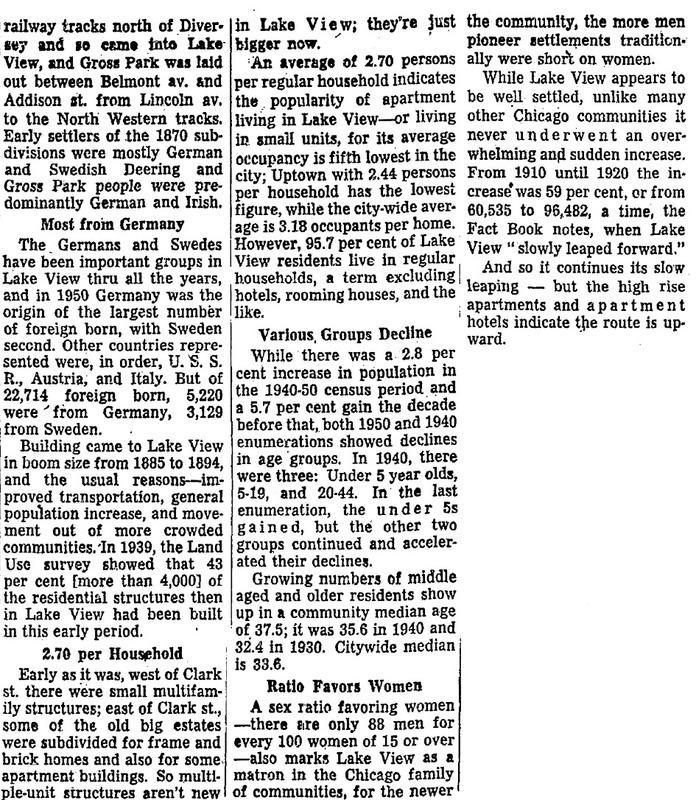 A lack of construction activity from 1930-1950 meant that by 1960 only 9% of structures were less than 20 years old. 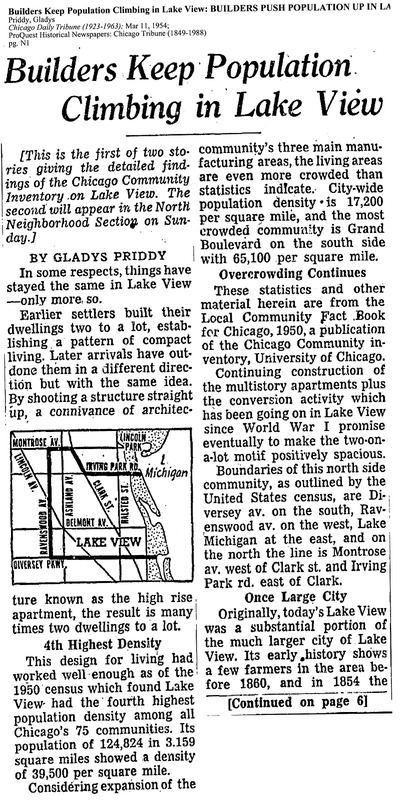 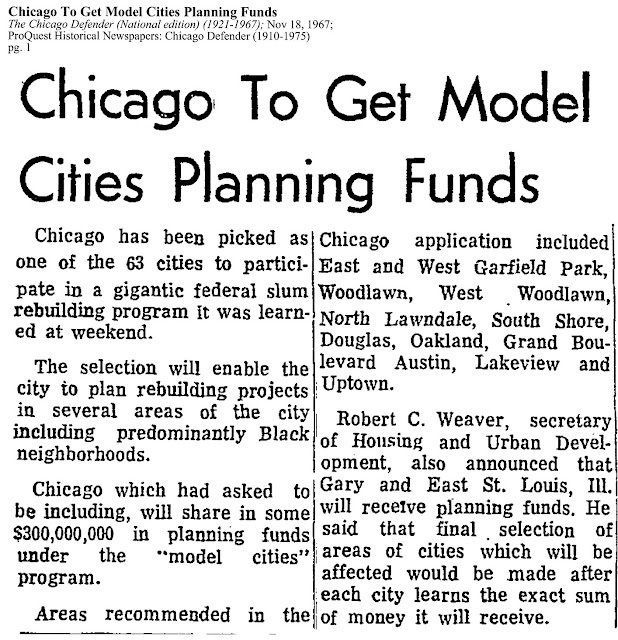 By 1970 about 300 single occupant 4-1 buildings were built primarily in Roger Park, Uptown & Lake View neighborhoods. 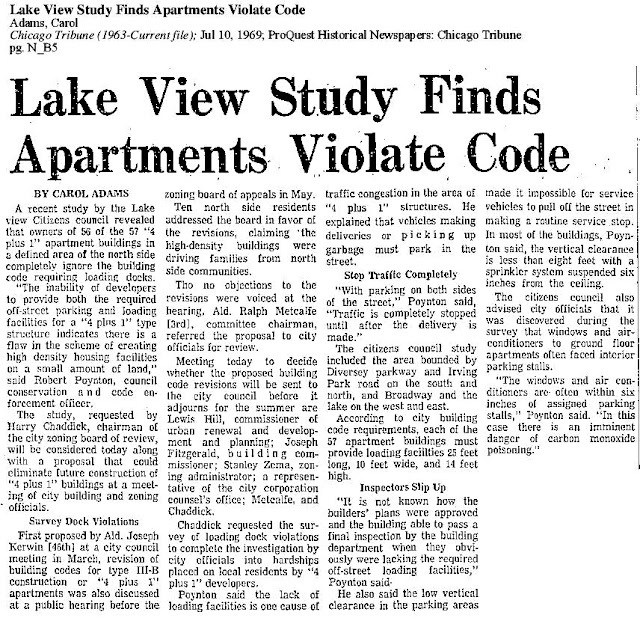 Another solution to increase of studios and one bedrooms or non-family units to locate in Lake View was the concept of condominiums. 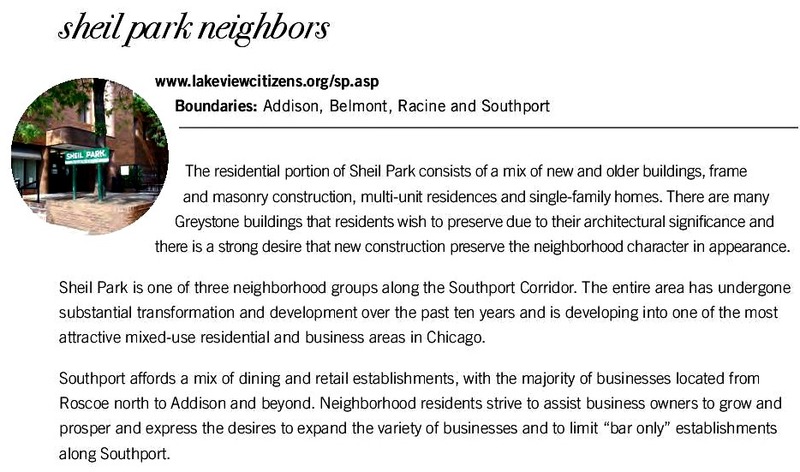 A resident needed to buy a space not rented it creating a sense of permanency and hopefully local community/neighborhood spirit and involvement in the associations. 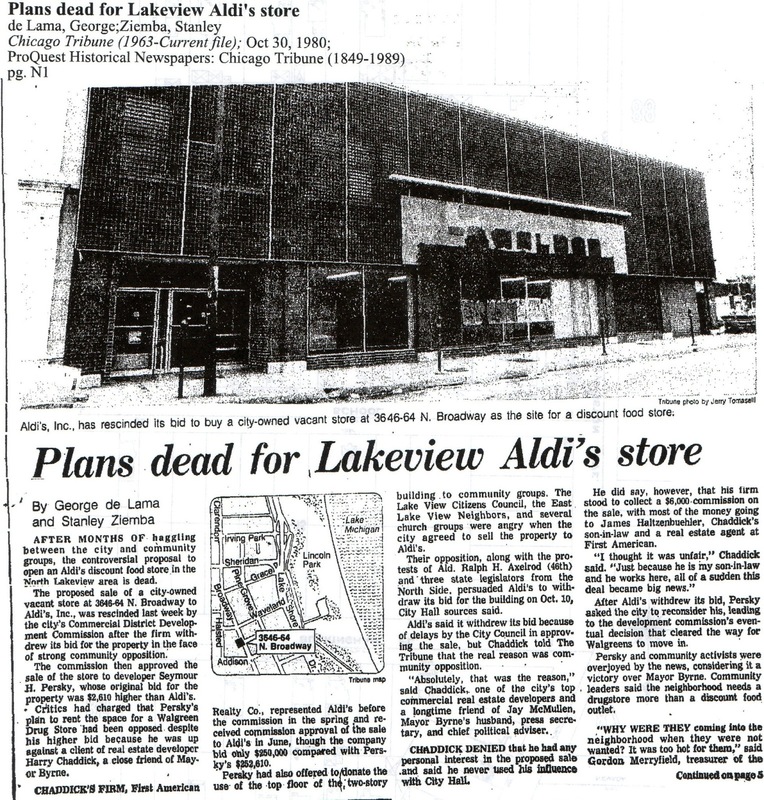 Aldi NO: The Associations win one! By 1980 22% of housing units are owner-occupied, mainly due to renovation projects by building owners. Many apartments are rehabilitated into condominiums. 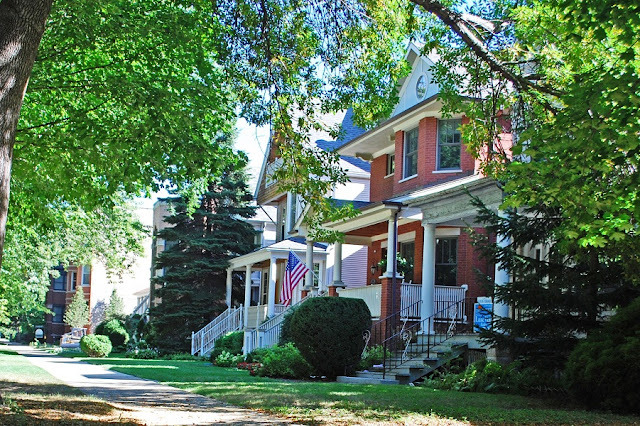 The median value of condominiums and single-family homes in the area was slightly higher than the city median. 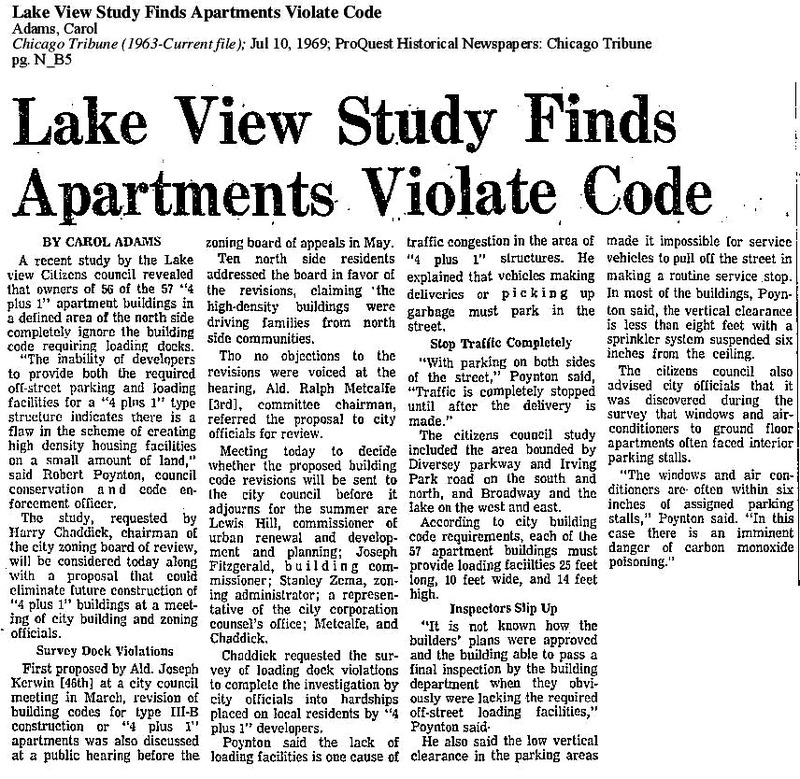 The number of subsidized housing units also increased due to federally-sponsored housing projects--though this was met with strong opposition from Lake View residents. 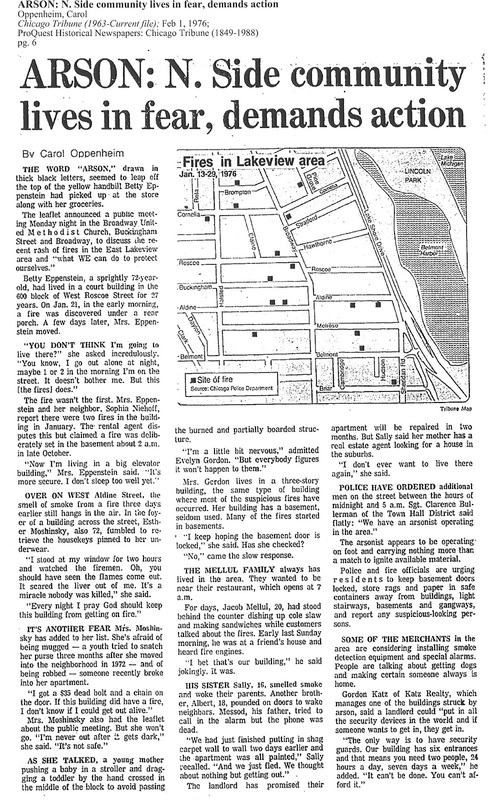 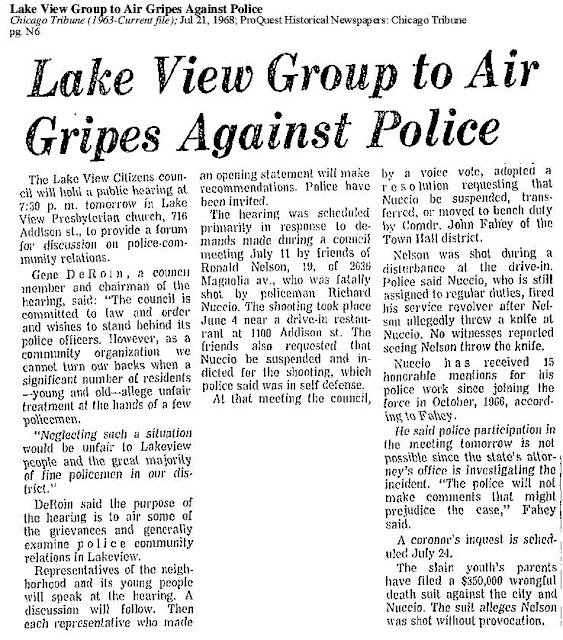 Lake View had its share of victories in the 1980's that included the saving of Nettelhorst and Agassiz schools, the Town Hall police station and a fire station at 1052 W. Waveland, near Wrigley Field due to civic pride and the hard work of local residents and local activists. Older buildings were renovated, and new and gay-owned businesses came to the neighborhood. In the residential areas, renovated homes and apartments were brought white collar folks and families to the neighborhood. 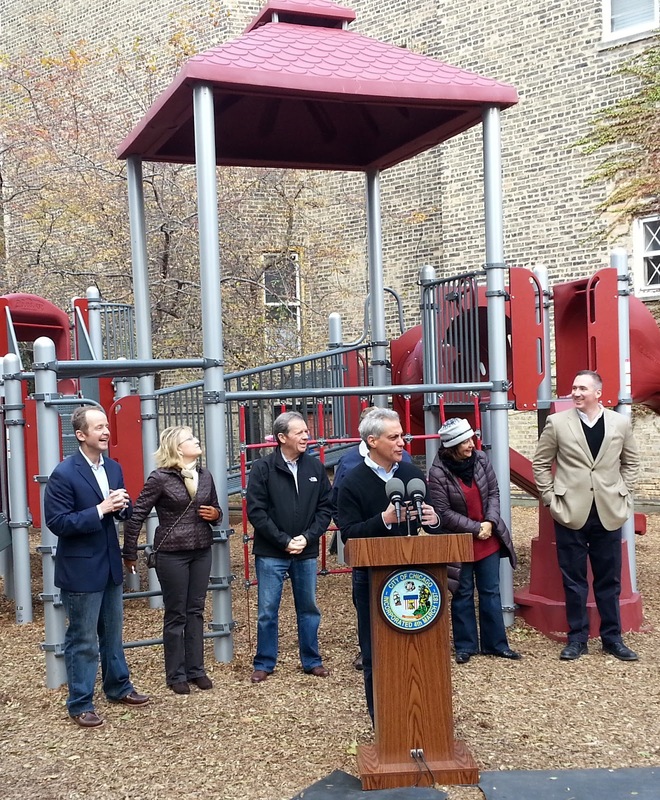 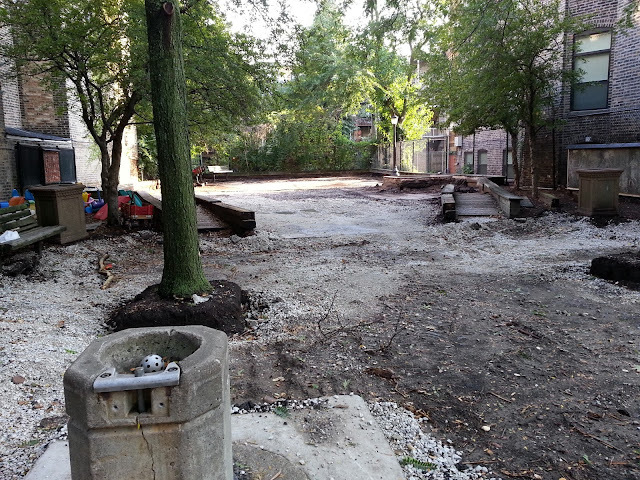 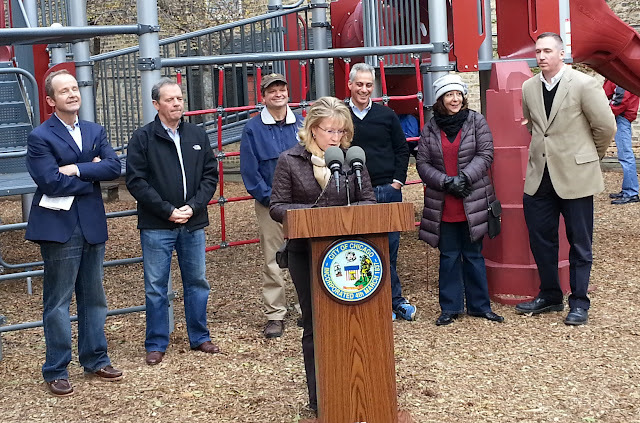 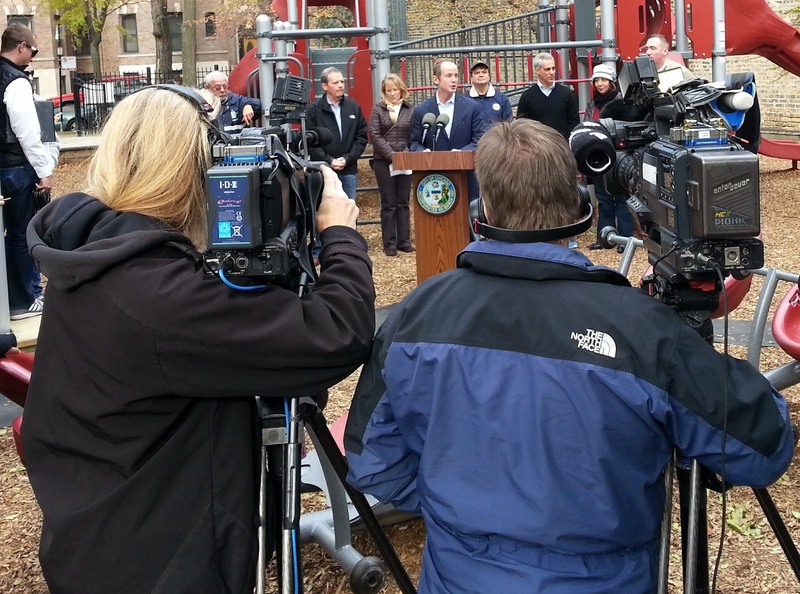 Civic and business organizations worked hard to revitalize Lake View and to prepare it for the next decade of growth. 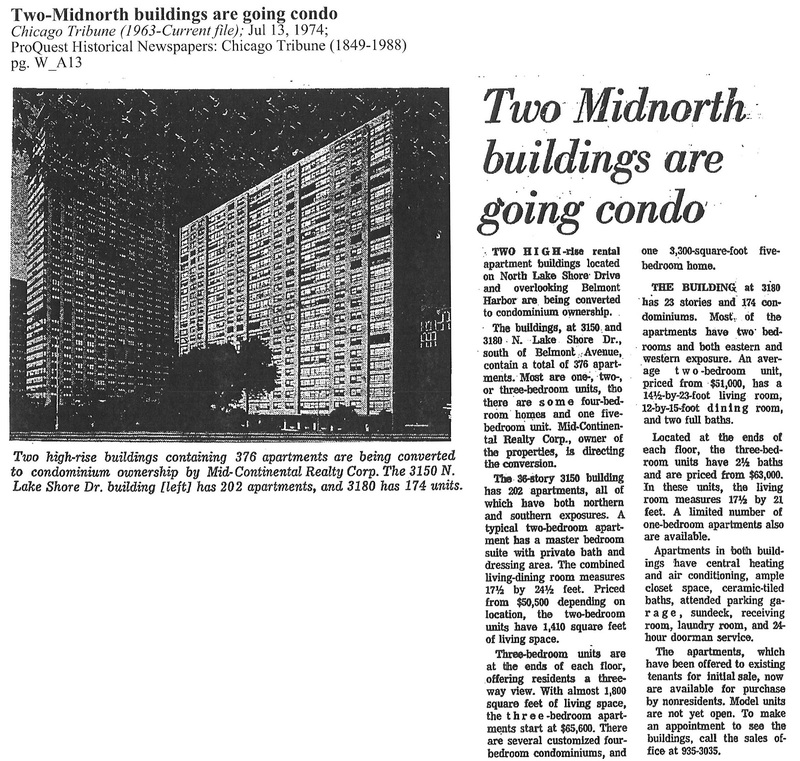 Growth and development were the two keywords for the 1990's. Both local and national businesses came to the area and property values rose at an accelerating rate. 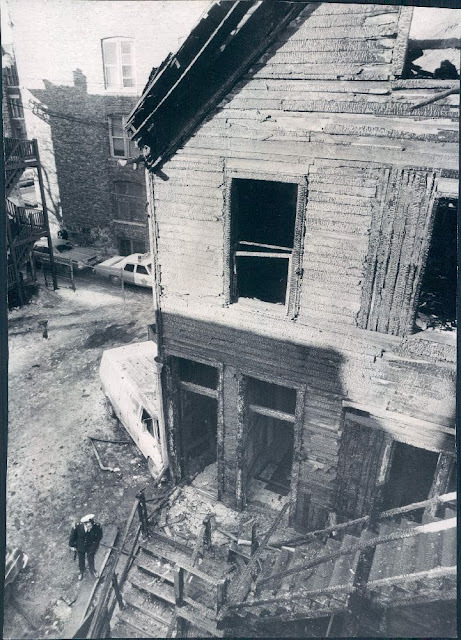 New structures were built on the sites of commercial and residential tear-downs. 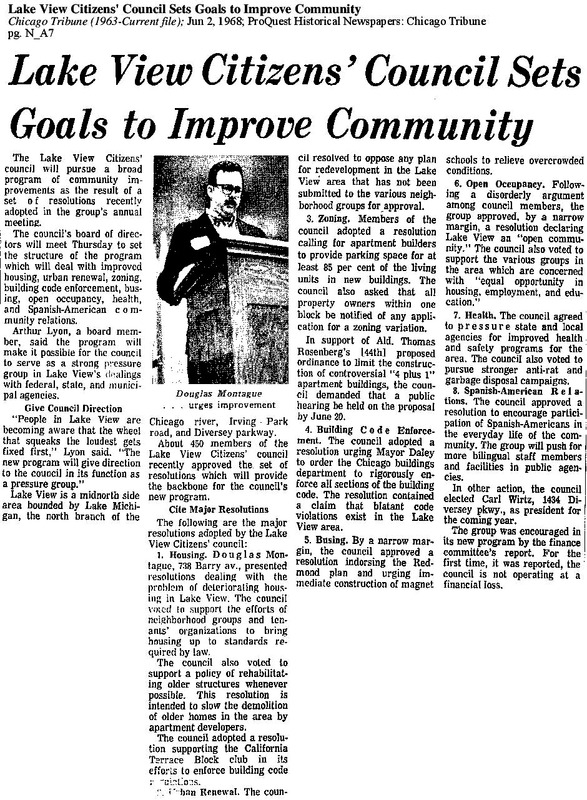 School councils worked to improve education, business chambers developed programs to promote commercial development, and resident associations tried to maintain and improve the quality of life. The organization (Lake View Citizen’s Council) was founded when a group of residents joined local clergy in an effort to shut a number of nightclubs on Broadway between Diversey Parkway and Roscoe Street. The clubs' reputations, including possible mob connections, and a shooting angered residents, president Gregg Kiriazes said. 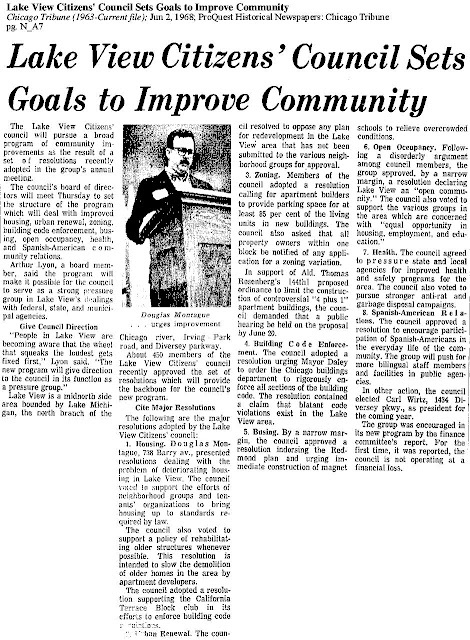 Although various civic organizations and block clubs existed, community leaders decided an all-inclusive organization would have more impact. In September 1952 the Lake View Citizens Council was incorporated as a non-profit organization "to watch over the social and civic welfare of Lake View, to work for what will improve it and to abolish whatever will hurt it." 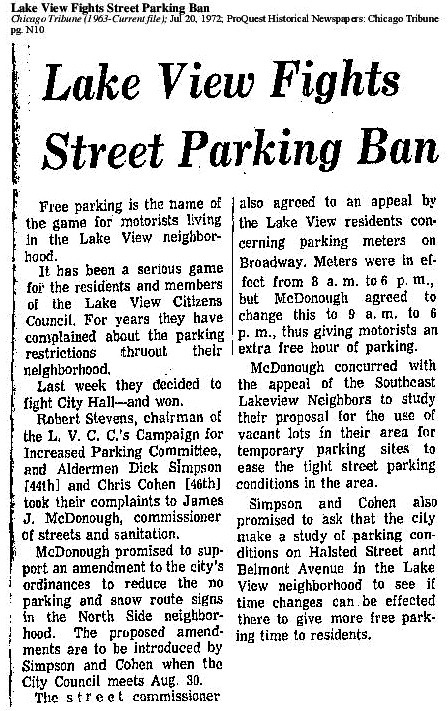 One of the group's first successes came in the mid-1950's when President Eisenhower began pressuring baseball owners to include night games, said Charlotte Newfeld, a longtime board member and chairwoman of the group's parks and public green space committee. 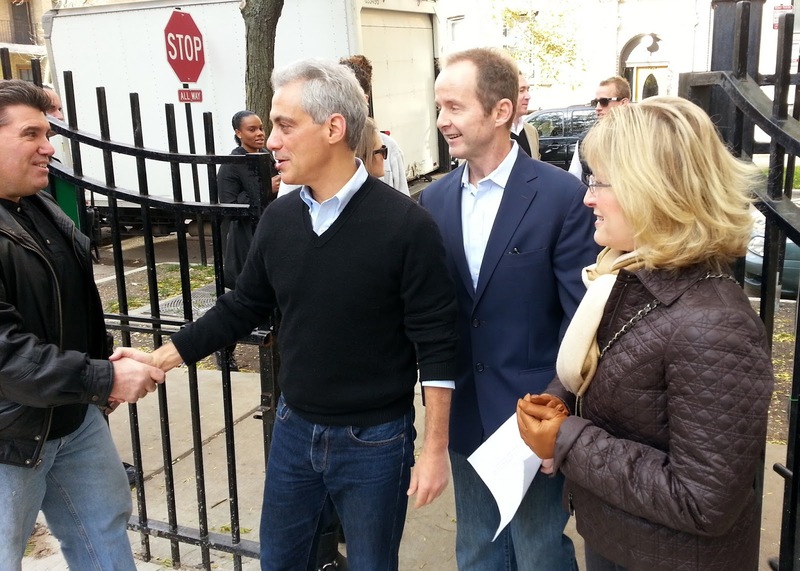 Cubs' owner P.K. 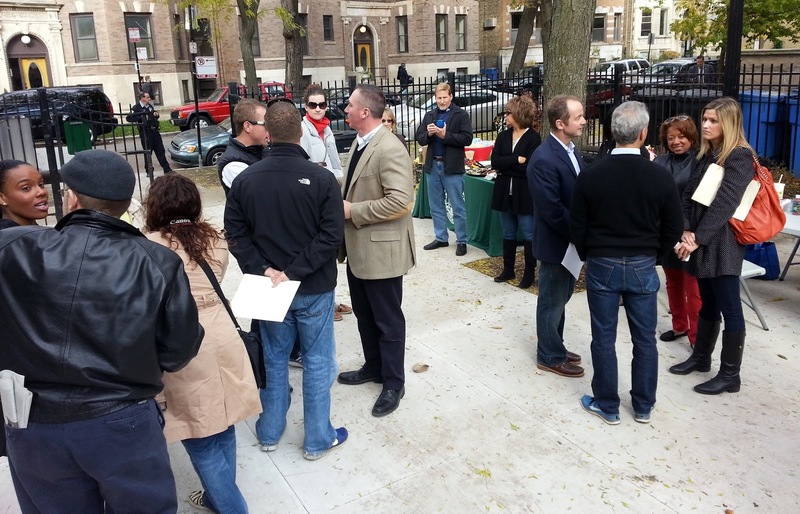 Wrigley and the council launched a petition drive opposing the plan. 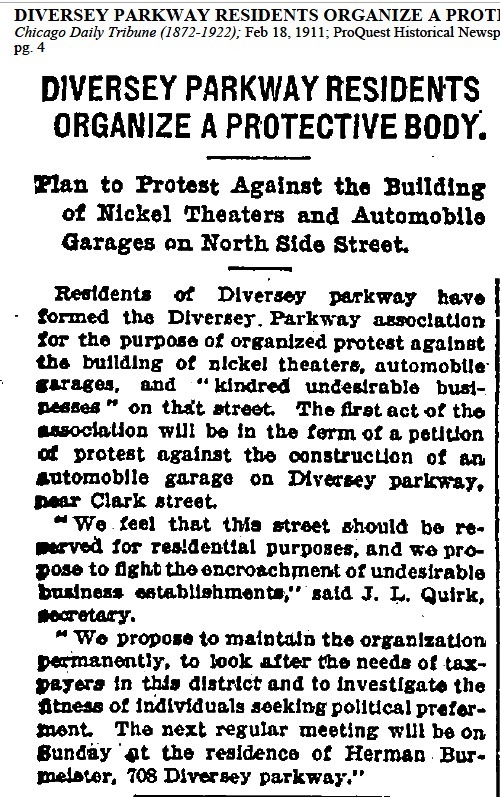 With more than 2,000 names, they were able to show that neighbors opposed lights at Wrigley Field. Over the years the council has handled zoning issues, organized street fairs, sponsored efforts for improved streetscapes and supported a variety of neighborhood causes.Successes during the 1970's included lobbying for and construction of Chicago Park District facilities in Sheil and Gill Parks, and influencing the city to change its building code to stop the spread of four-plus-one apartment buildings. 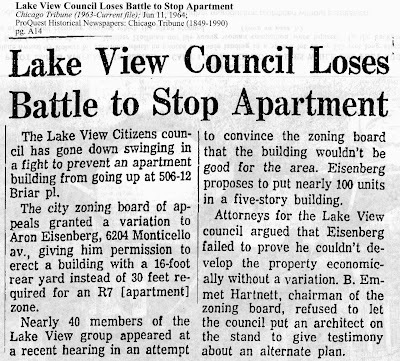 In the 1990's, the group influenced zoning changes in several overcrowded areas as part of an ongoing effort to prevent increased density. "The Lake View Citizens Council, an organization representing 11 neighborhood groups in the community, sent a letter to (Mayor) Emanuel Wednesday detailing their thoughts on the Wrigley expansion project" via an online news source called the Lakeview Patch. 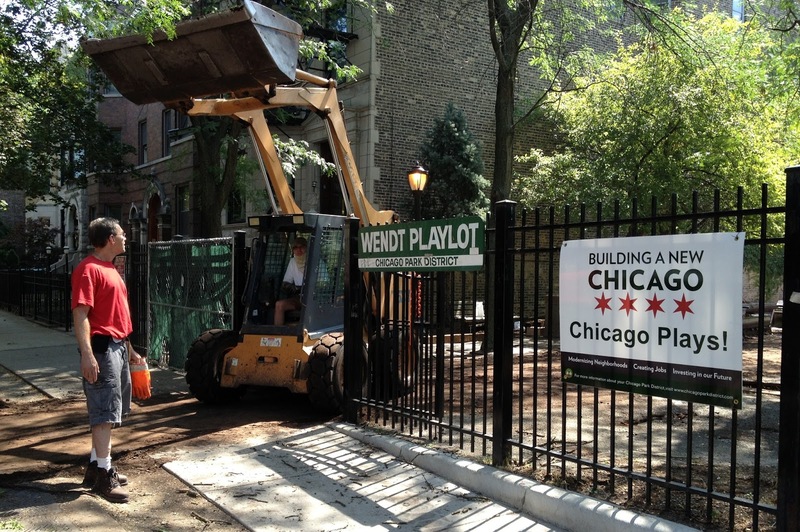 This controversy between citizen interests and Wrigley Field interests created a new neighborhood association that favored the renovations at the park 'without restrictions'. 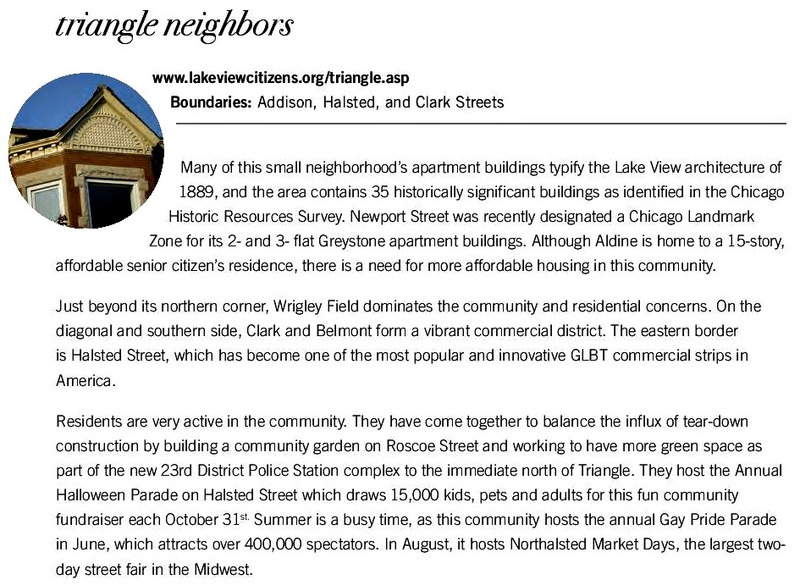 That new association was called the 'Wrigley Neighbors'. 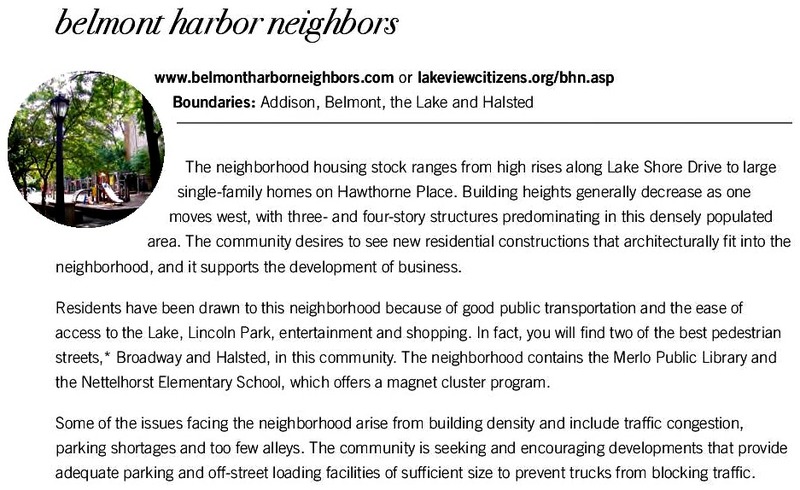 Belmont Harbor Neighbors voted to dissolve by the directors of the board effective December 31, 2013. 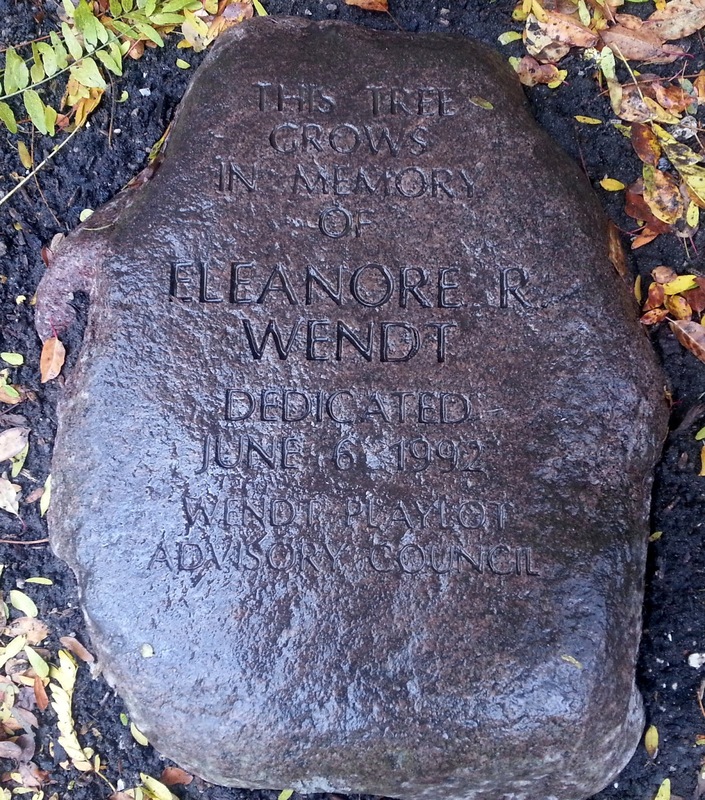 An email was sent to the membership in February 2014. 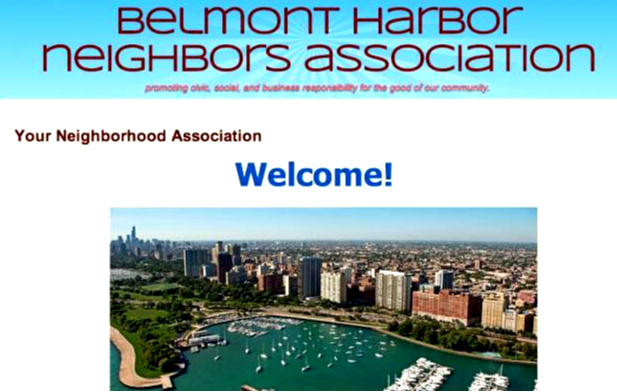 If you have not already heard, the Belmont Harbor Neighbors (BHN) Board of Directors has voted to dissolve the organization. 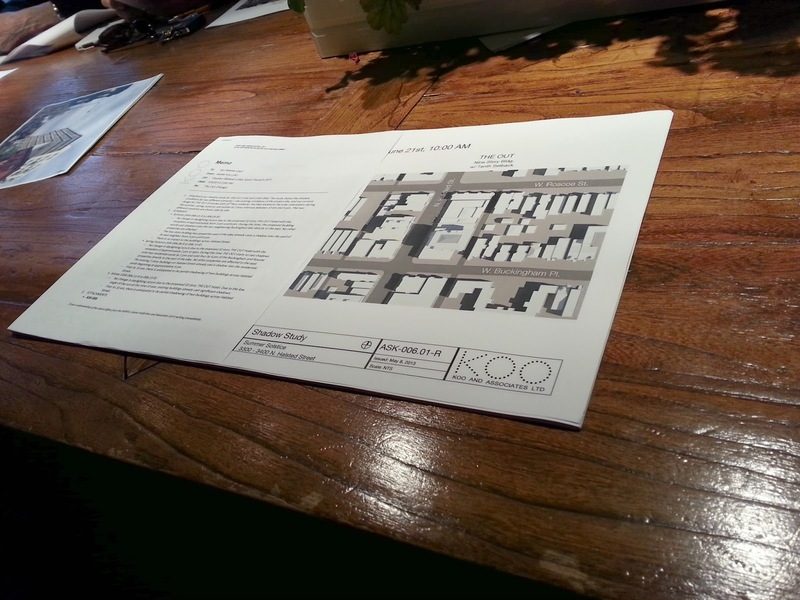 We wanted to advise you of the decision sooner; however, we were informed that a news article was going to appear regarding the BHN dissolution. 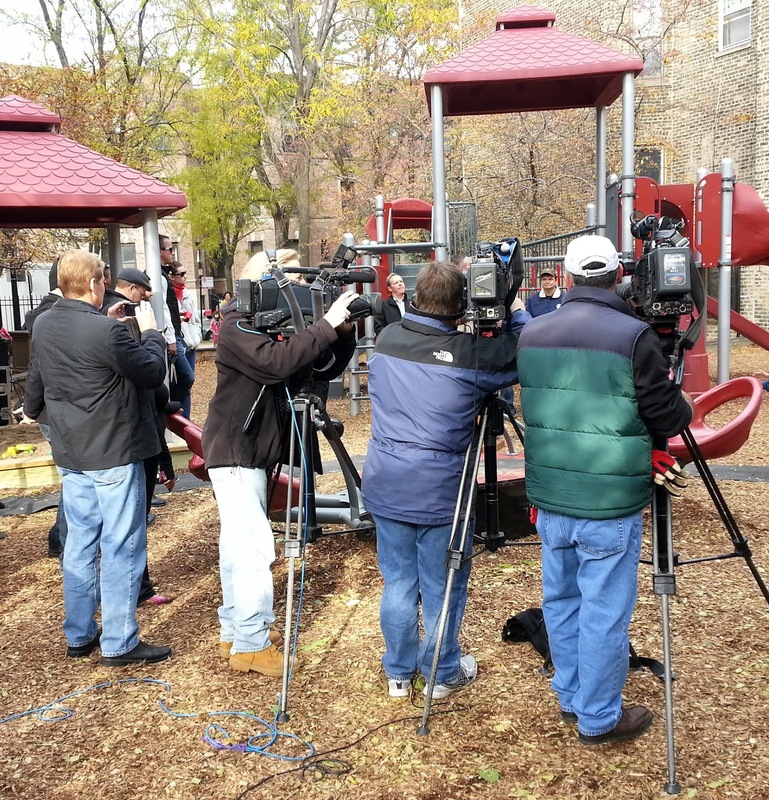 We delayed our communication as we were not sure what the article would state. 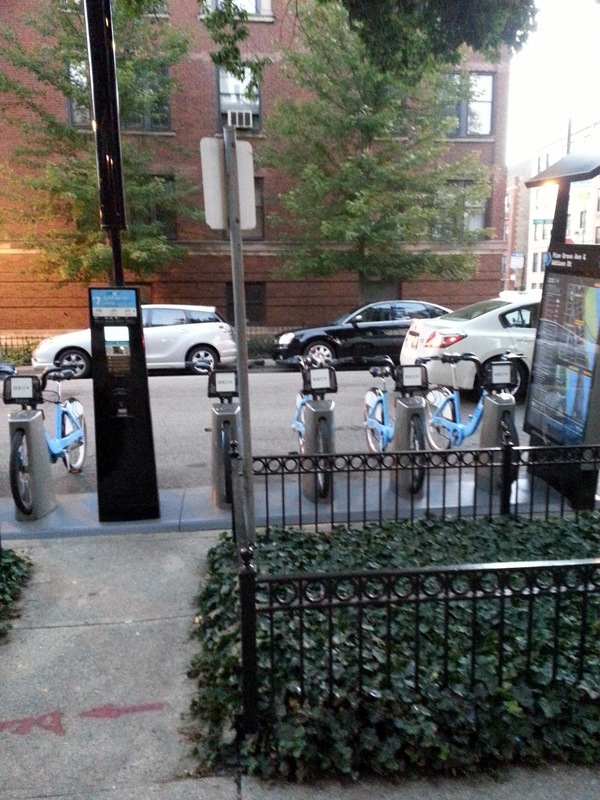 The facts are that over the last 4 or 5 years BHN paid membership dwindled for various reasons. As a result, funds available to pay operating expenses also dwindled. 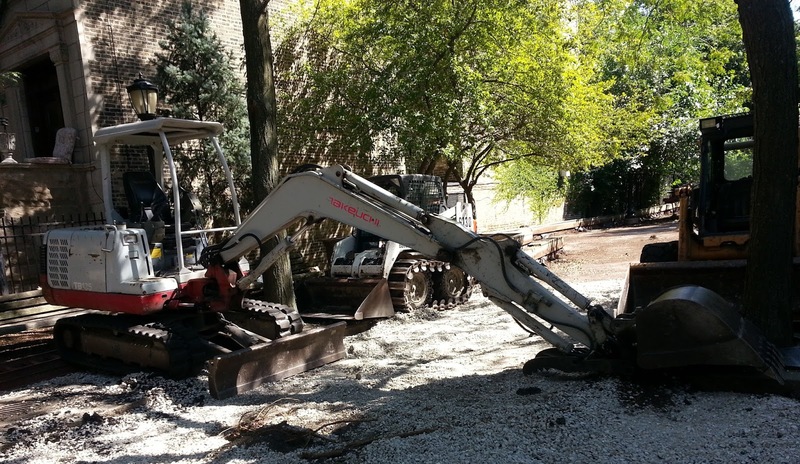 In the last 9 months BHN encountered a significant increase in unexpected expenses on top of its normal operating expenses. 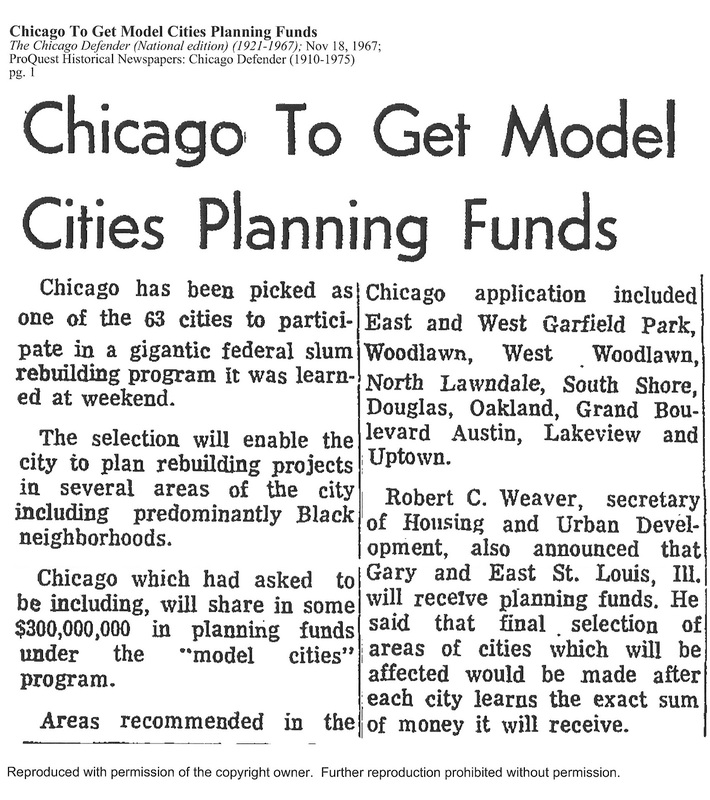 One of the unexpected expenses was attorney fees to advise the Board on numerous allegations levied against BHN and the Board. 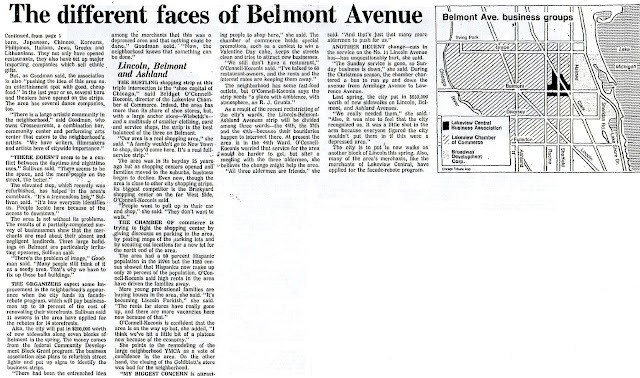 Several attorneys, operating on a pro bono basis, were consulted to review many of the allegations and found them to be without merit. 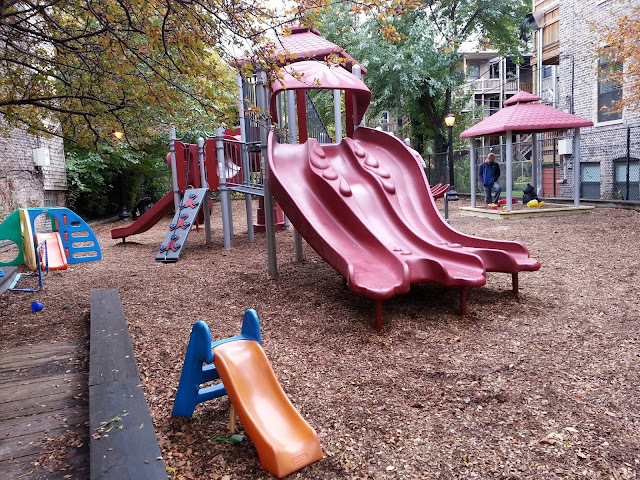 However, the allegations in the last few months became very serious and the Board decided to hire an attorney to review the allegations in detail. The hired attorney also found the allegations without merit but fees were incurred. 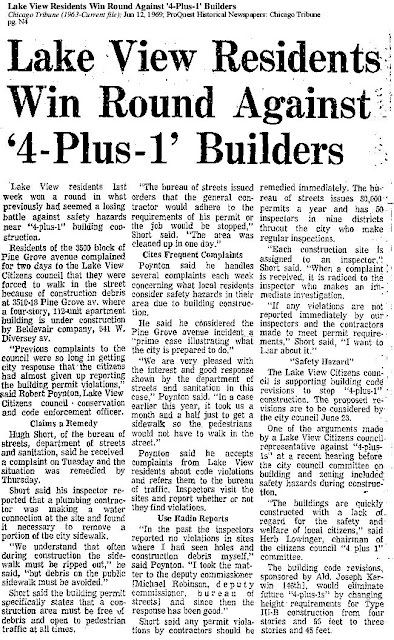 With funds already disbursed and after an analysis of expected revenues and future operating costs, it became clear to the Board that BHN would not be able to operate financially on its own and meet its financial obligations. 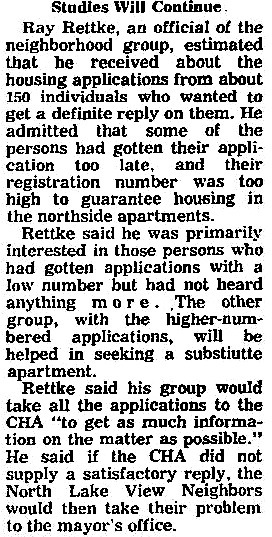 It was also determined that it would be next to impossible to increase membership to such levels for the entity to operate independently. 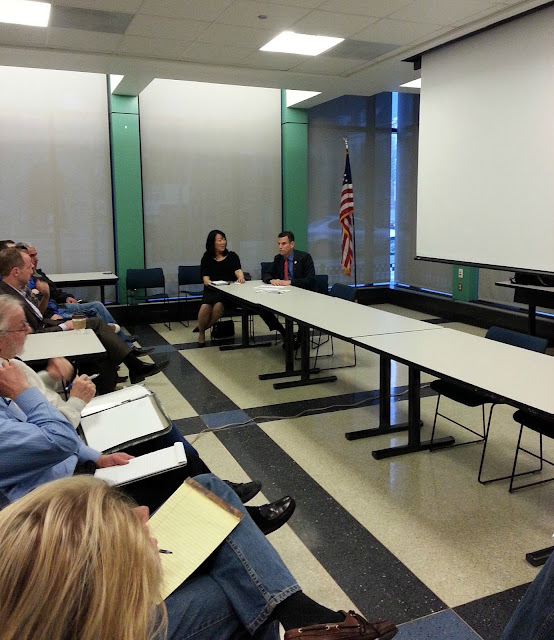 In addition, the Board efforts and organization costs were disproportionate to the small number of paid members. 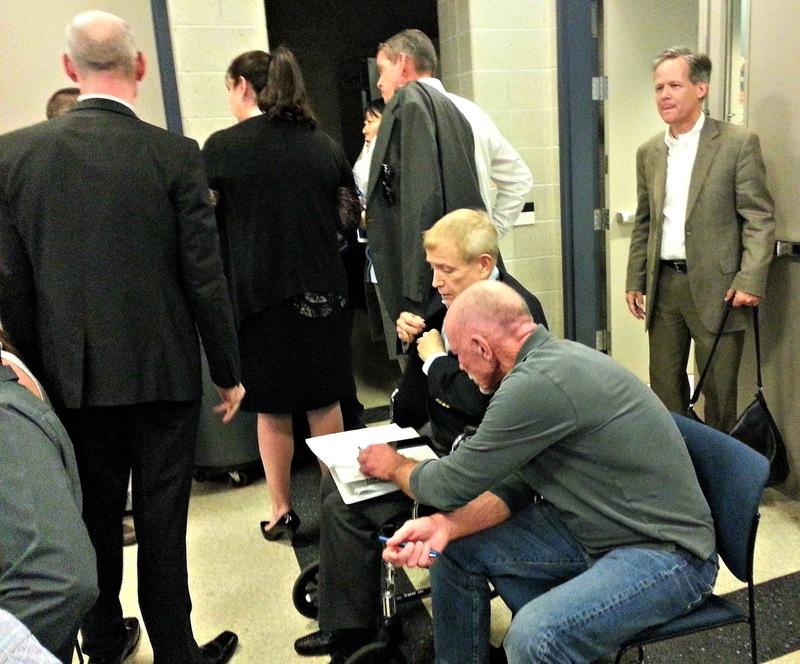 Finally, the Board discussed the organization’s financial situation and a super majority of the Board approved and voted in favor of dissolution. 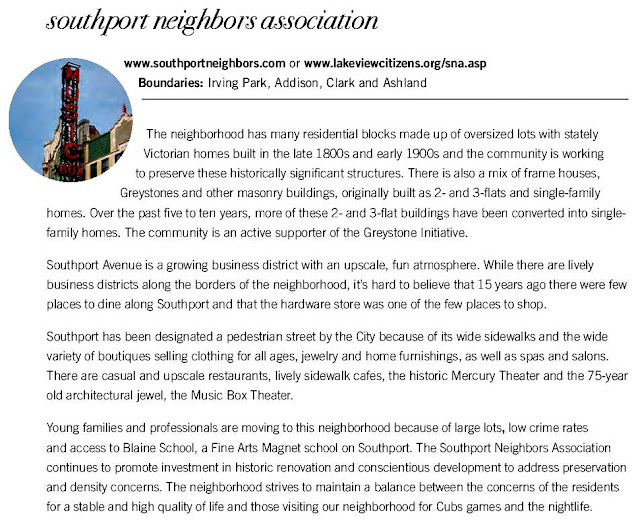 We thank you for your interest in the community and your support. 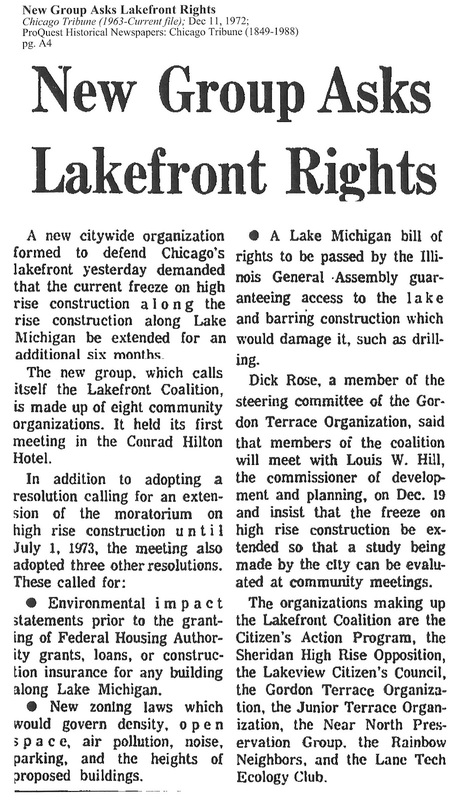 'Rifts in the organization appeared to begin last summer of 2013, when the BHN board clashed with Lake View business owners and employees over plans for the Out Hotel Chicago. 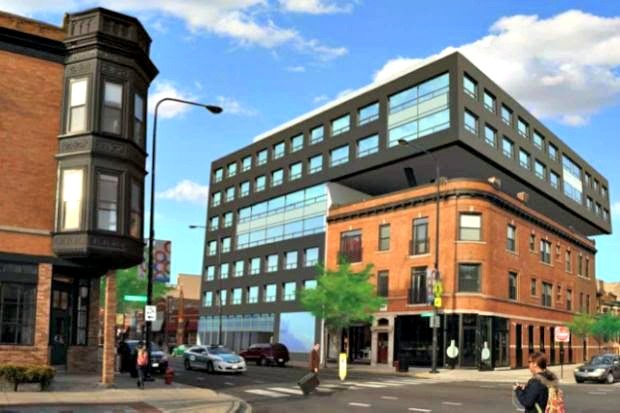 The group ultimately rejected Parkview Developers’ proposal to build an LGBT-focused boutique hotel at 3343 N. Halsted St., and Ald. 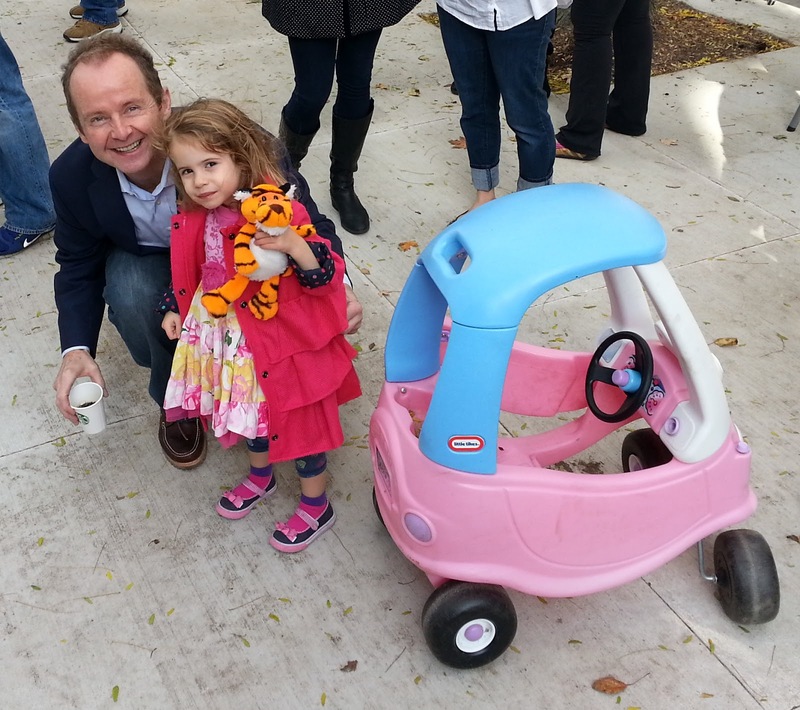 Tom Tunney (44th) followed suit. 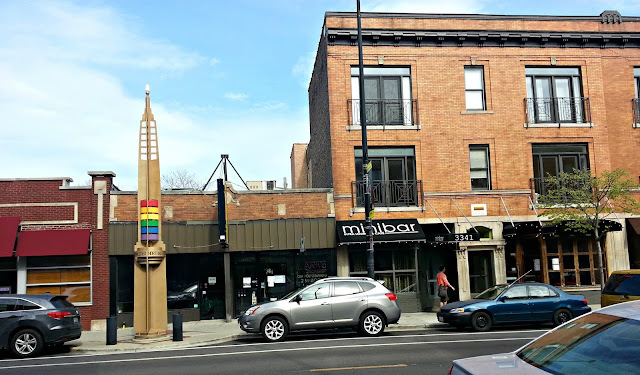 Robert Brumbaugh, owner of Progress Bar, 3359 N. Halsted St., threatened to bring legal issues to the Illinois attorney general if Ochab and his wife did not step down from the board, claiming the way they handled the Out Hotel vote violated state non-profit laws. 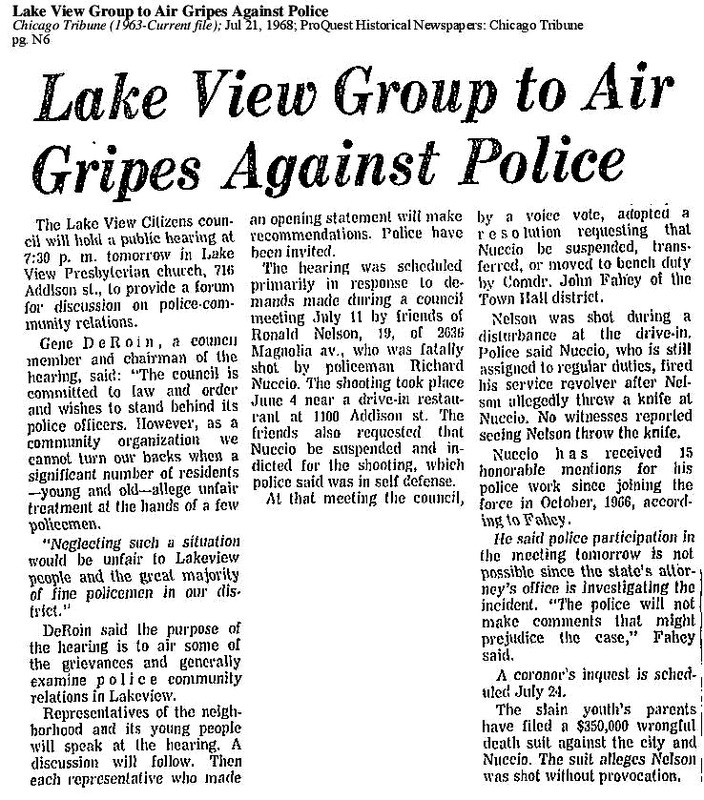 The Chicago Tribune articles below tell a tale of how the civic associations of Lake View tried to resolve the issues of their day. 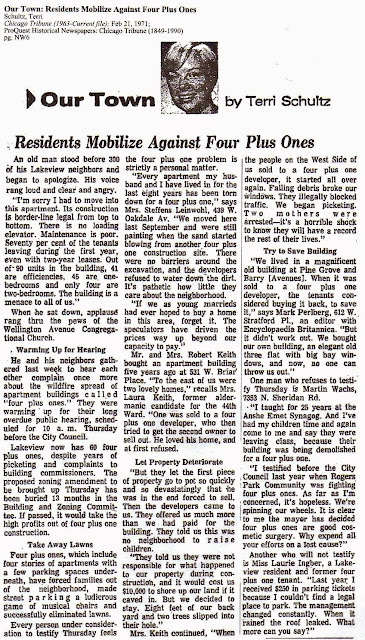 As early as 1952, if not before, the suburbs were booming with middle income family developments while the city struggled with individuals and lower income families that needed to stay from economic survival within the city. 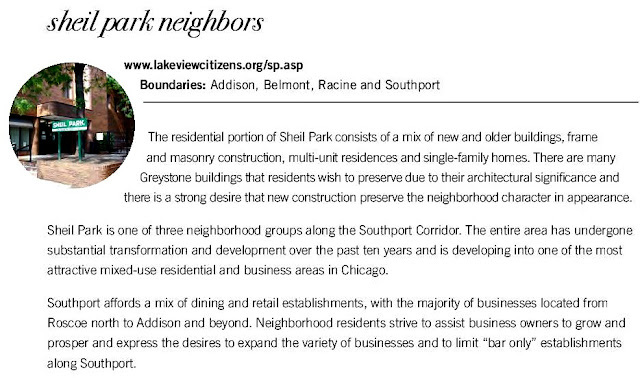 Urban renewal that was the only a concept during the 1930's and 40's - now became a reality by the 60's forcing an urban flux within the neighborhoods of Lincoln Park, Lake View as well as Uptown - new groups of folks moving in and the old establishment folks moving out. 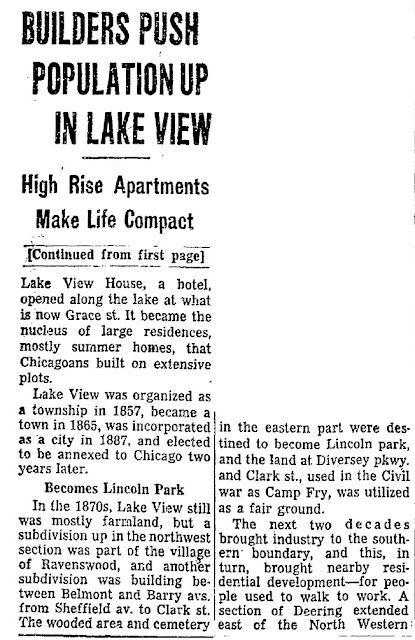 Urban renewal began in the near north-side within Gold Coast and Lincoln Park forcing a low income population northward into Lake View and Uptown. 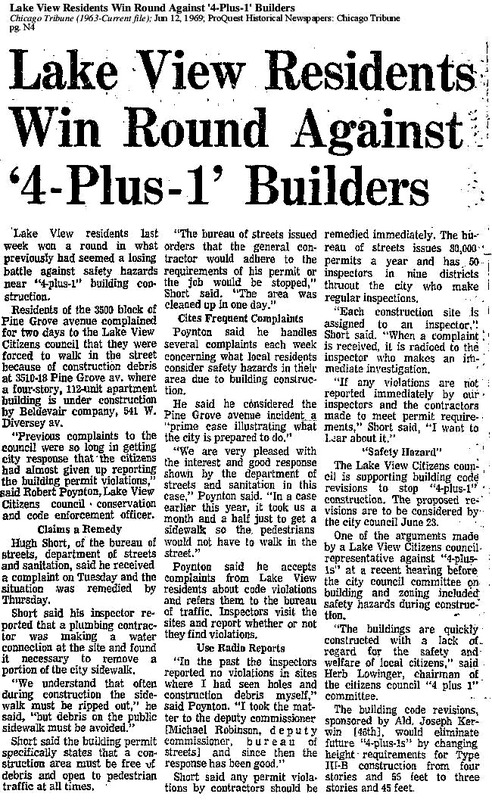 Existing mansions and houses in Lake View were sold and/or redeveloped into room-to-rental or torn down for a new class of building. New mid-rise buildings were built for single or coupled individuals, no longer for families. 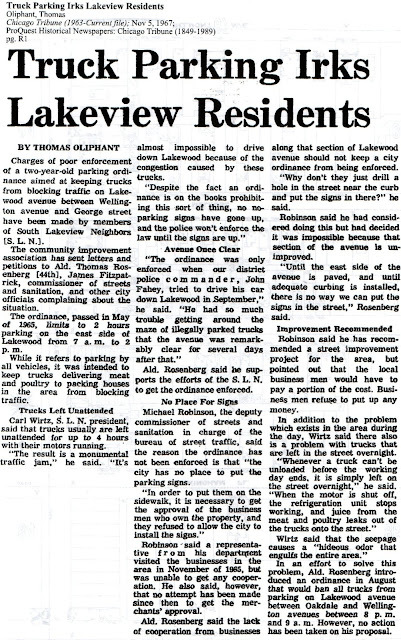 Some would say, at that time, the community spirit that was once Lake View was changed to a new cultural reality. 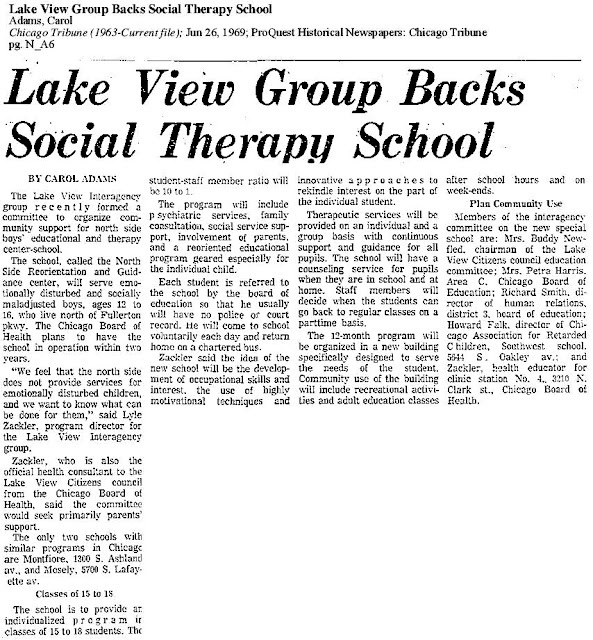 Organizations were established to handle this constant influx of new folks and cultures that began in the late 1950's and continued for decades to come. East Ravenswood/West Graceland community is within the borders of Lake View so that community has a shared interest in both the RCC and the LVCC. 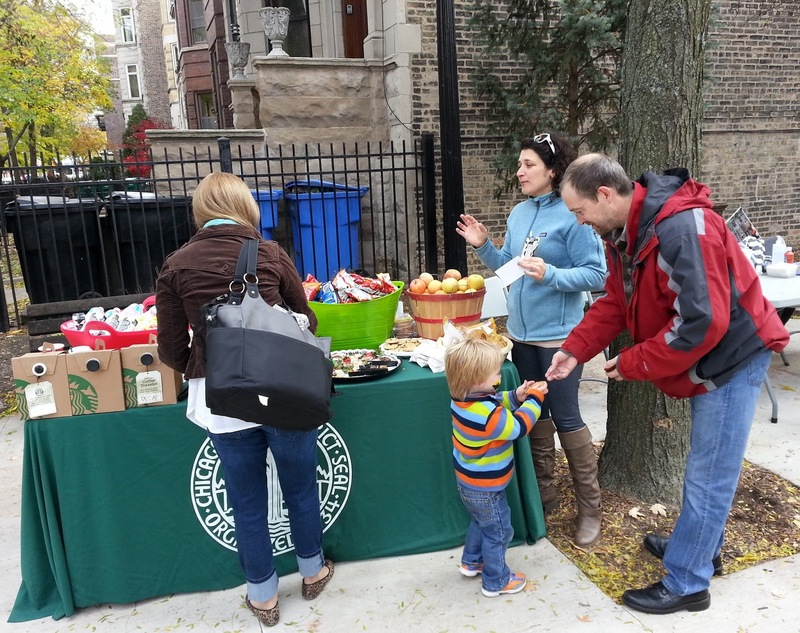 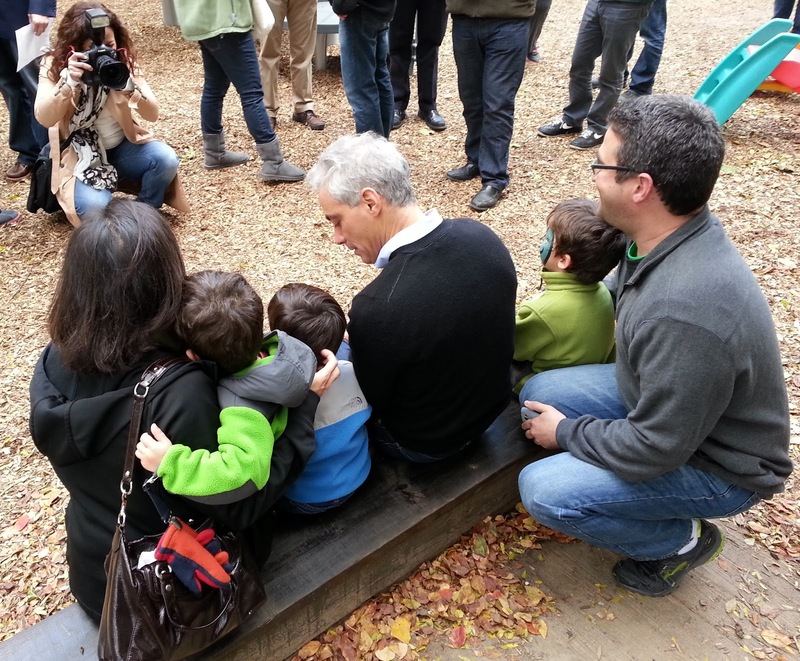 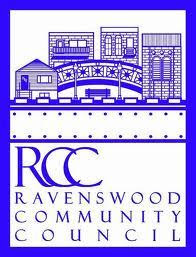 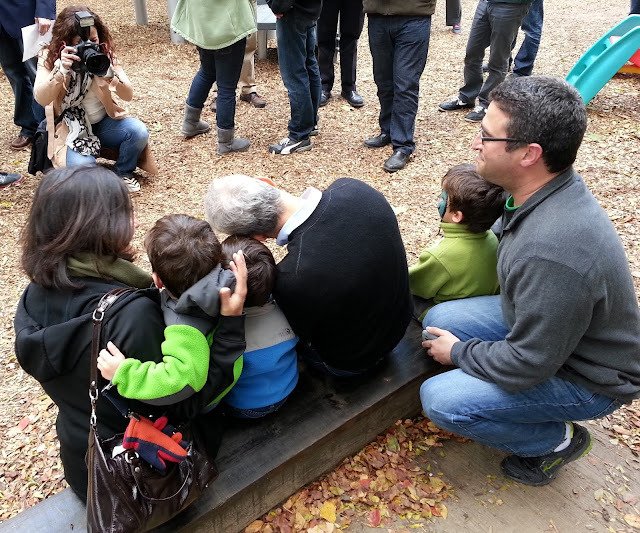 Since 1958, Ravenswood Community Council has served the diverse interests of local residents and businesses. 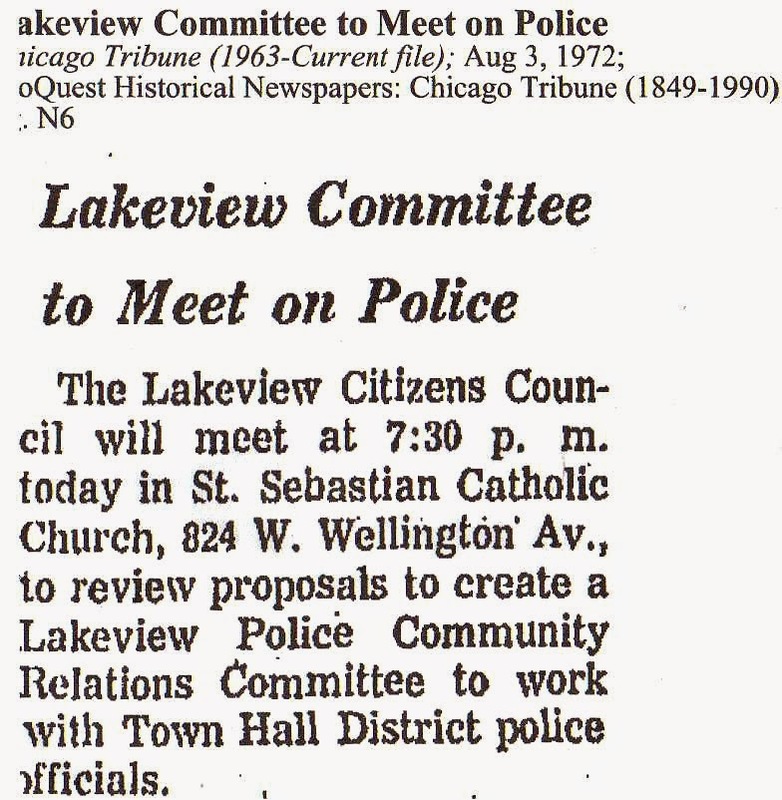 Like the LakeView Citizens Council the RCC was originally founded to fight crime and community blight. 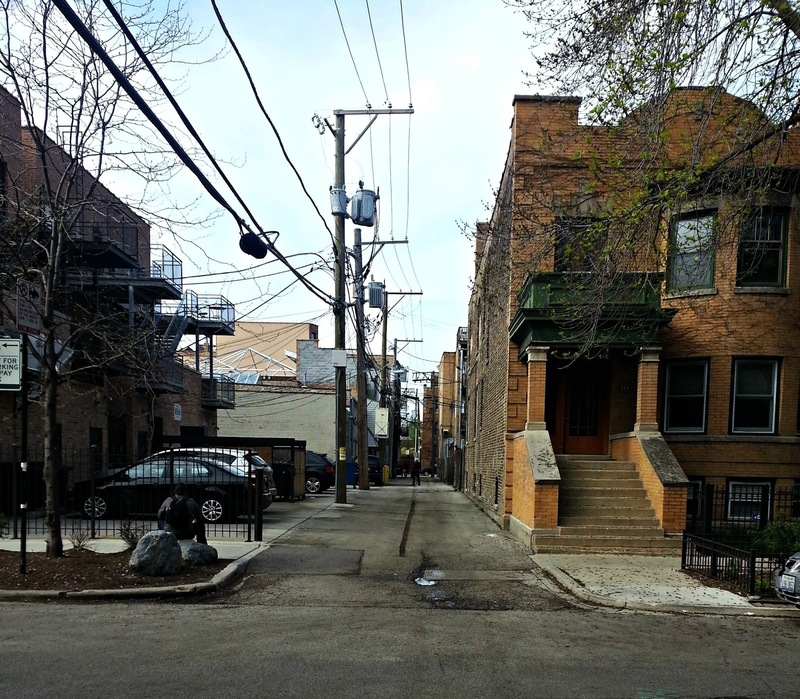 Bryn Mawr Avenue on the North, Clark Street on the East, and the Chicago River on the West. 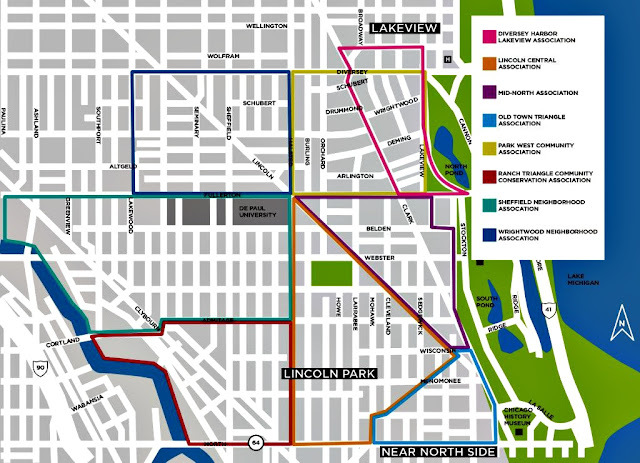 This area includes the Lincoln Square and North Center neighborhoods. For the neighborhood of Lake View that means community of East Ravenswood/West Graceland; the area west of Clark Street, Ravenswood Avenue to the west, Addison Street to the south to Montrose Avenue to the north. 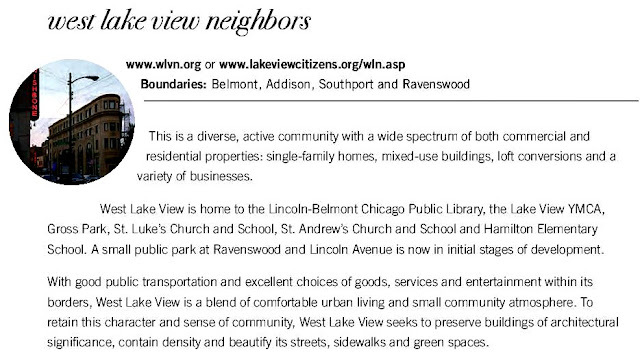 This association apparently shares it responsibility in both Lake View and Lincoln Park (see map). 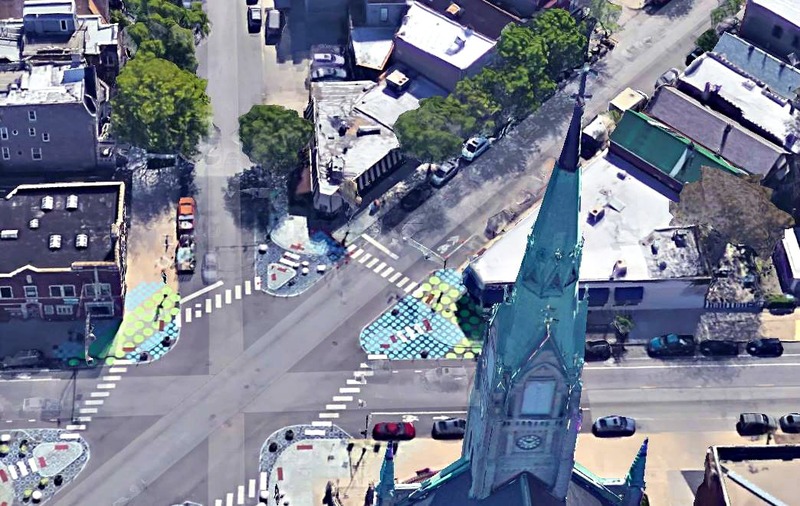 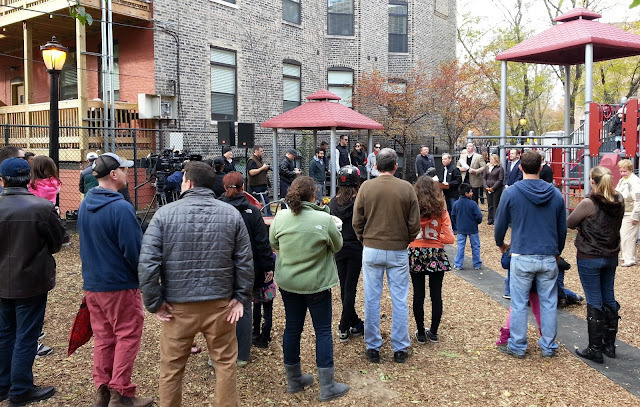 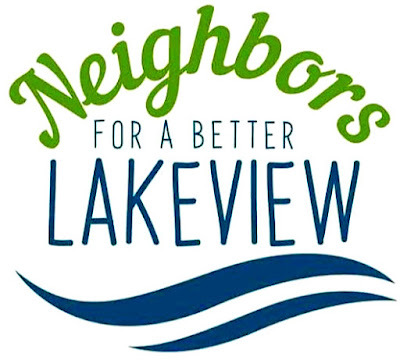 The Lakeview Action Coalition (LAC) currently called Organization Neighborhoods for Equality: Northside (ONE Northside) was a singular non-profit, multi-issue community organization that has a more broad involvement in issues of the day. 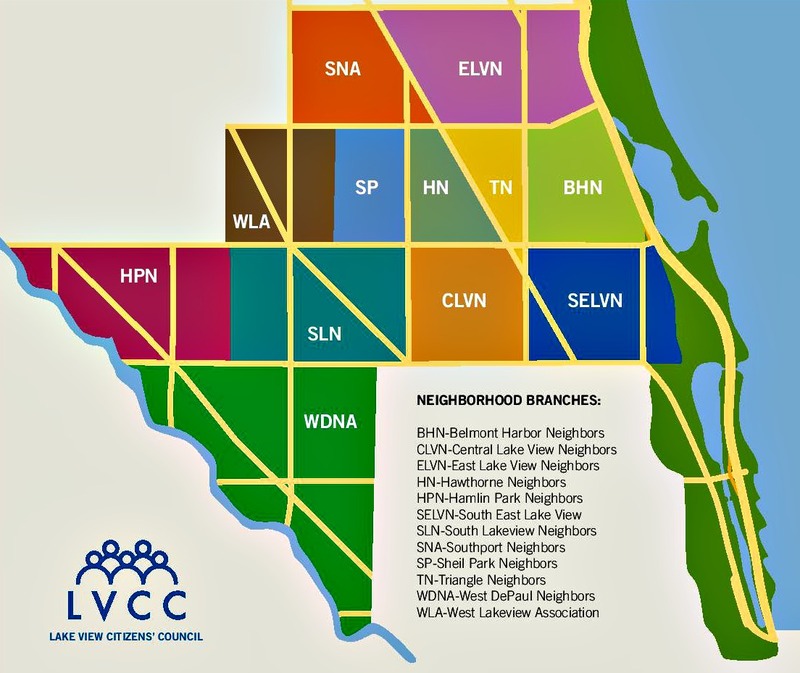 The Coalition is comprised of 41 institutional members, including religious congregations, non-profit agencies, banks, business associations, a credit union and a senior citizens caucus. 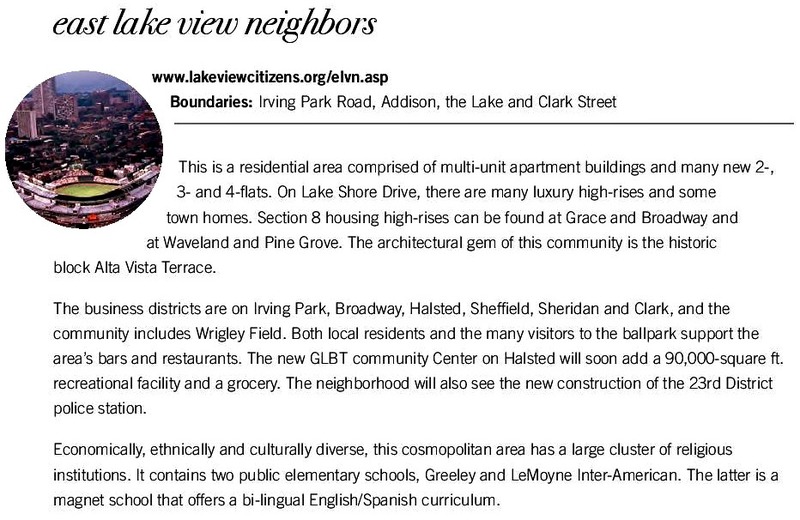 These diverse institutions are stakeholders in the Chicago communities of Lakeview, Lincoln Park and North Center. 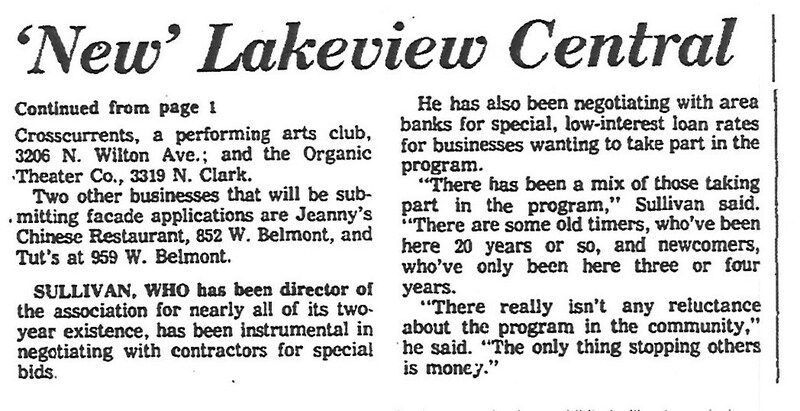 In December of 2011 peeved at what they described big pay packages at the nation's biggest banks, a Chicago group urged its members Thursday to withdraw their money from such institutions, showing up at a Chase branch in East Lake View to demand a meeting with a bank executive. 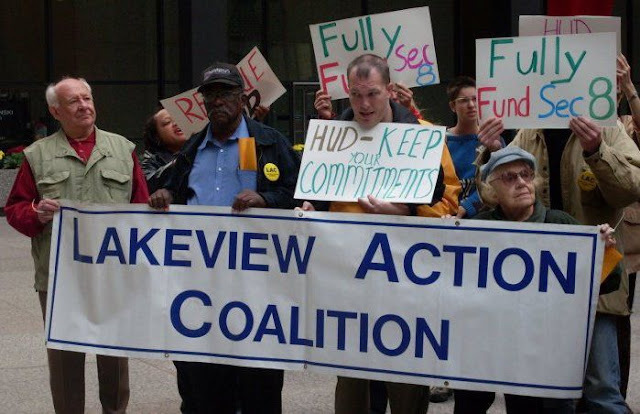 About thirty-five members of the Lake View Action Coalition marched on the Chase branch at 3032 N. Clark Street, shouting "Bust up big banks!" 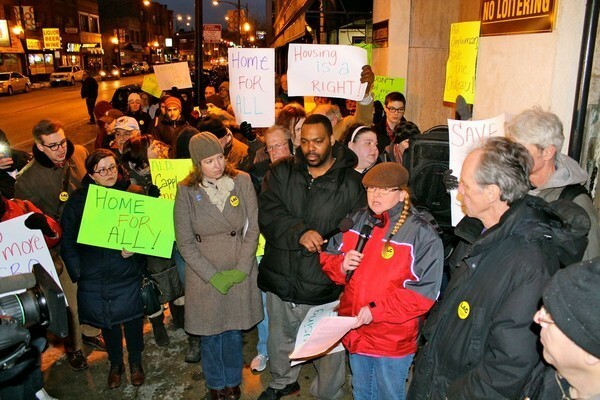 before being escorted out by police and rallying across the street. - the last SRO in the neighborhood. The Organization of the Northeast & Lakeview Action Coalition are combining forces to form a new activist group called 'Organizing Neighborhoods for Equality'. 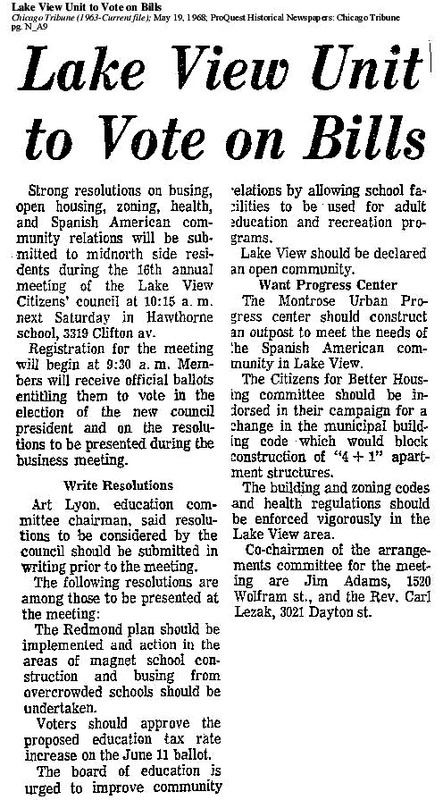 The following are some issues the association had to resolve or monitor that are typically of any association within the Lake View Citizen Council. 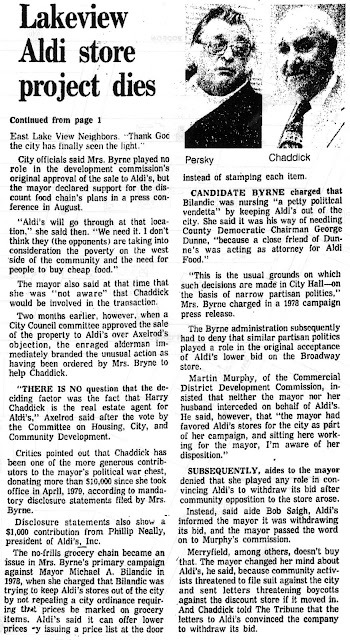 All photos were taken my me, Garry Albrecht, Communications Chair at the time. 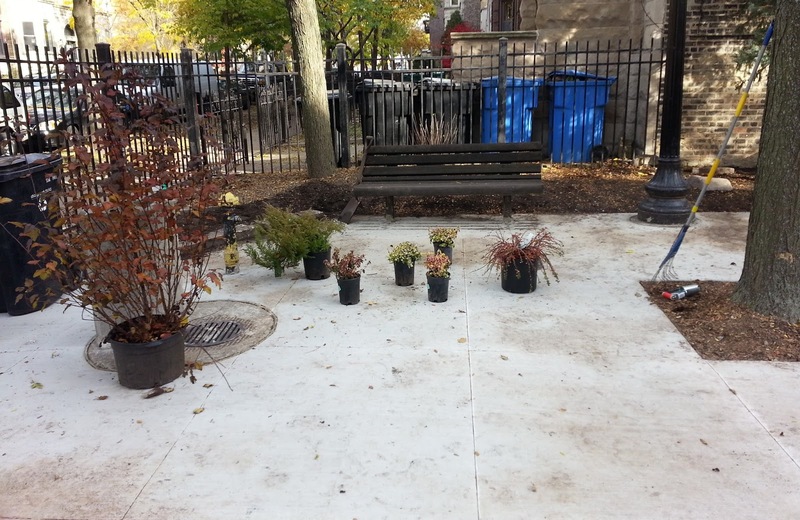 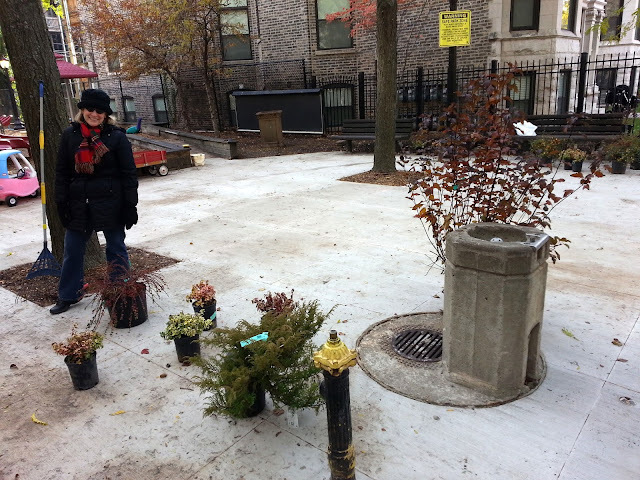 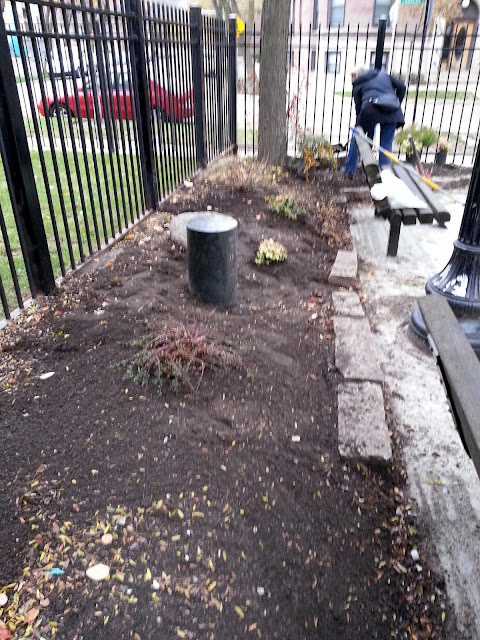 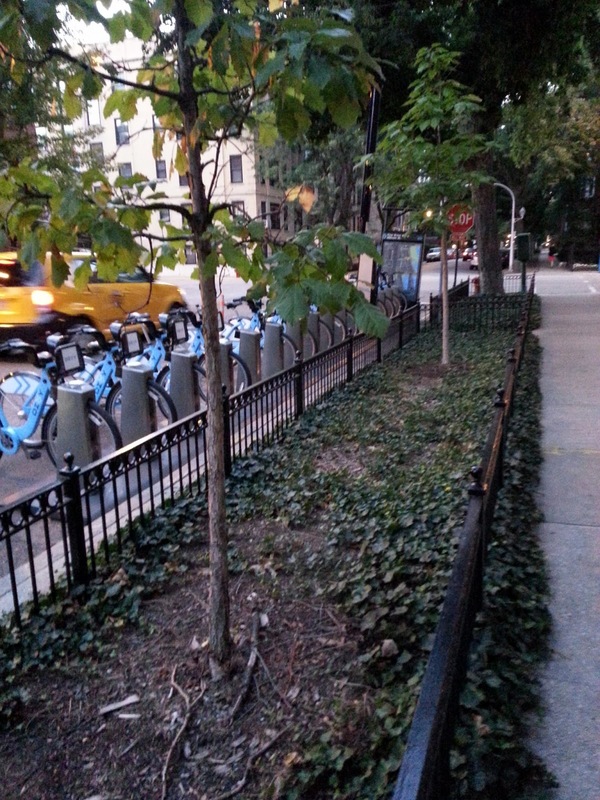 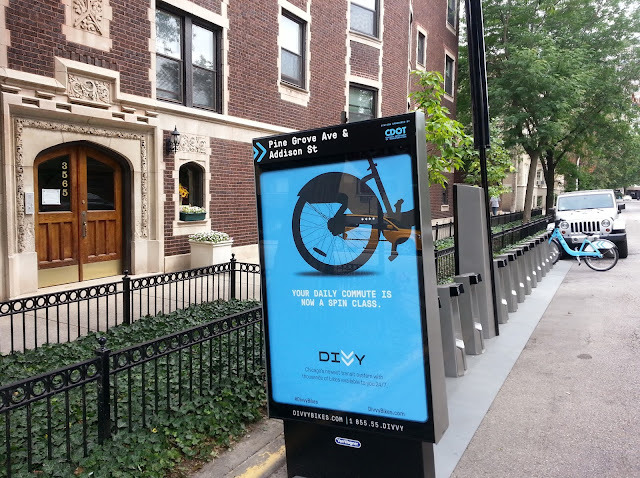 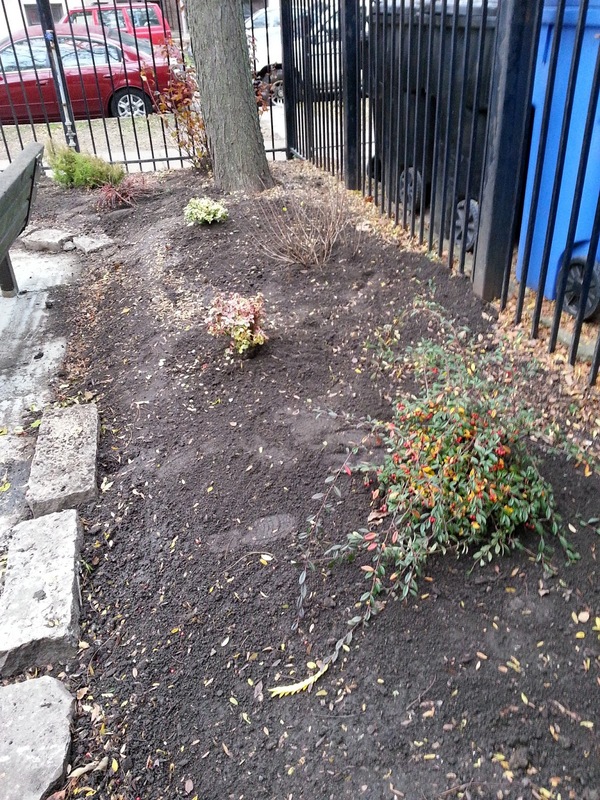 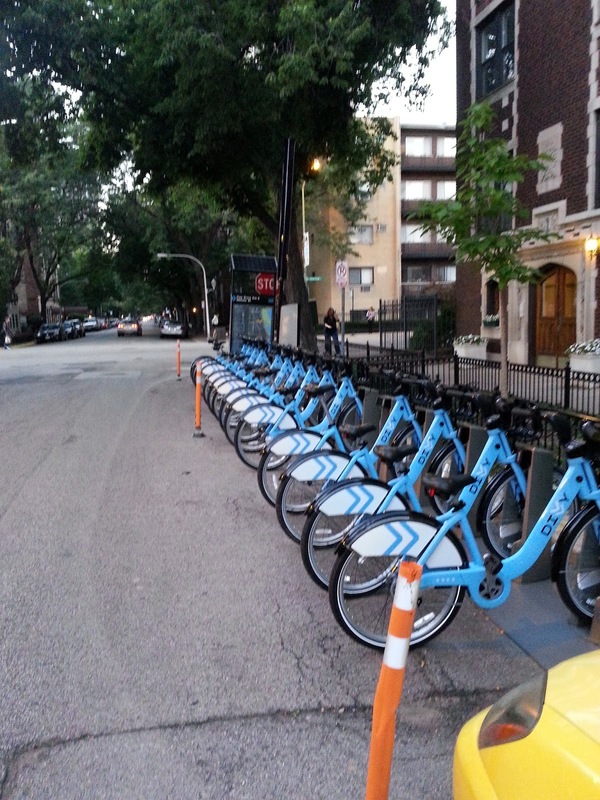 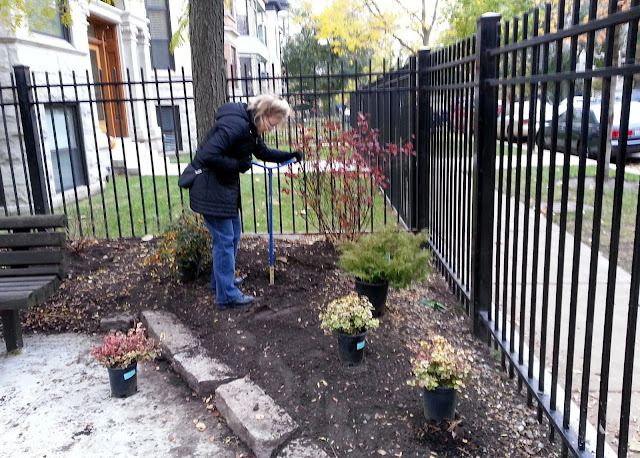 This company planted a station in front of a condo building on the corner of Pine Grove and Addison. 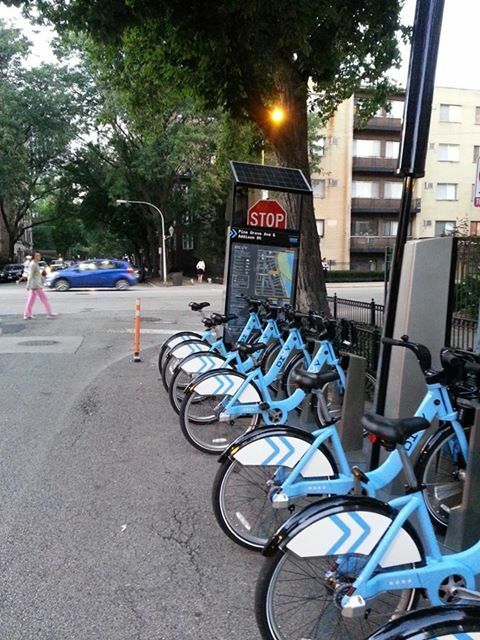 The problem was the location of the station at the corner near a stop sign. 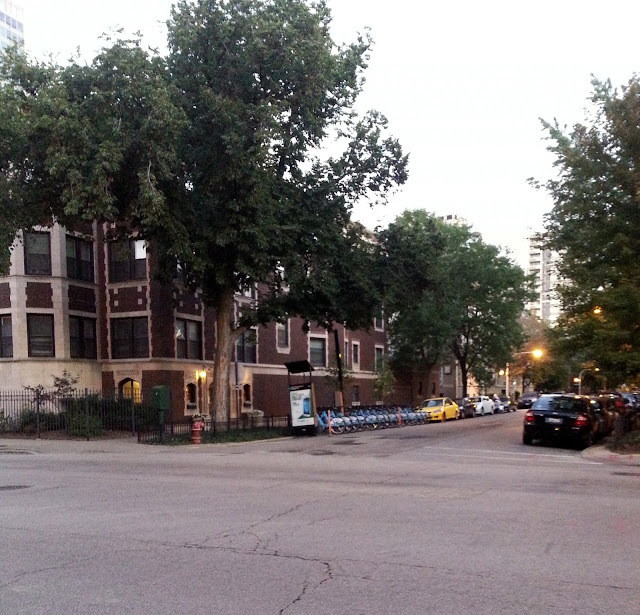 The condo association filed a lawsuit to have the station entirely removed from the corner. The condo owners asked for assistance from the our association. We agreed that only the solar panel of the station should be relocated due its immediate location next to the 'stop sign'. 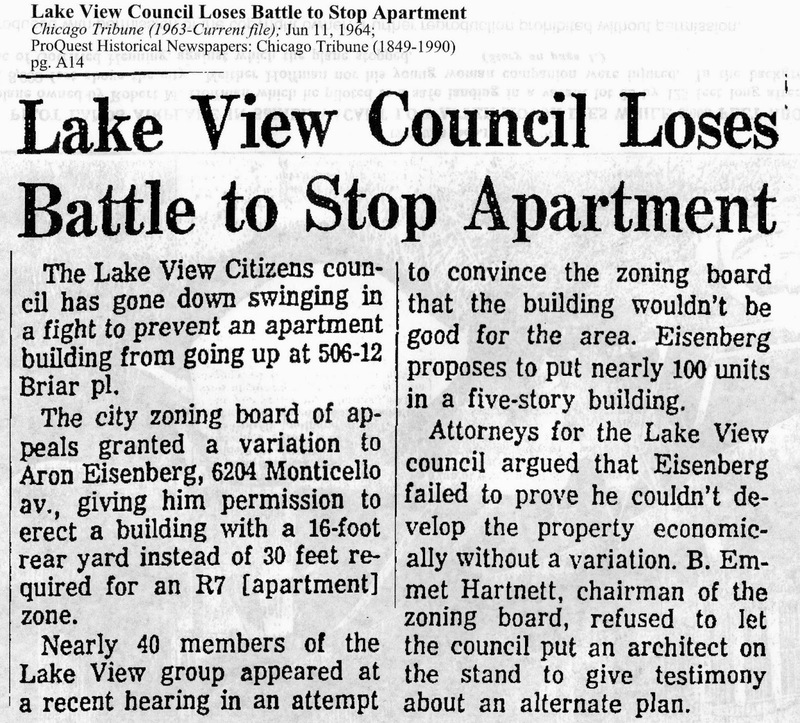 The condo owners were not happy over the compromise and continued with their lawsuit, a lawsuit that failed. Here are some photos I took before meeting that produced the compromise. 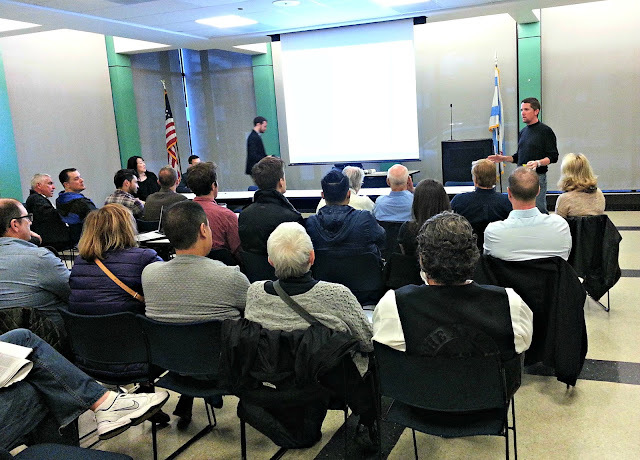 All photos were taken my me, Garry Albrecht, for the Board. 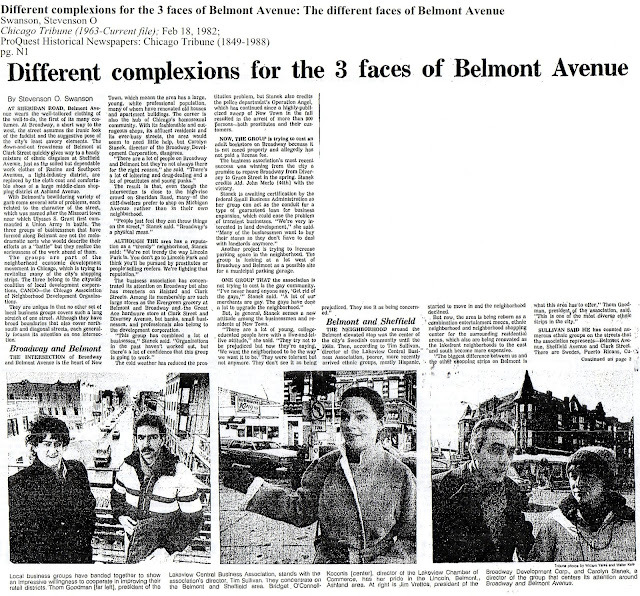 Read more about this issue from DNAinfo with this link, this link, and then finally this link. 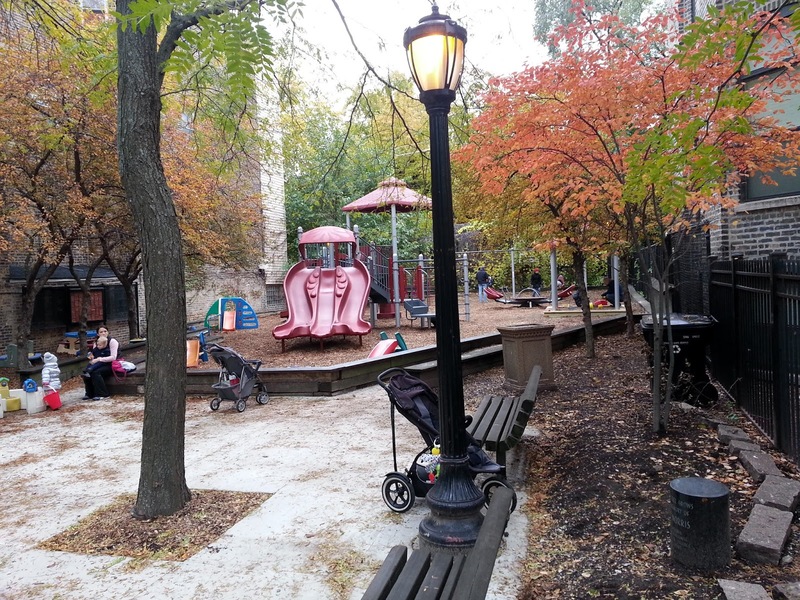 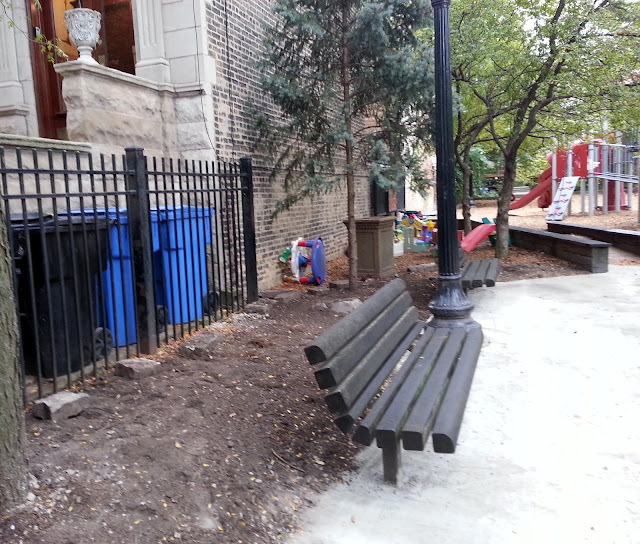 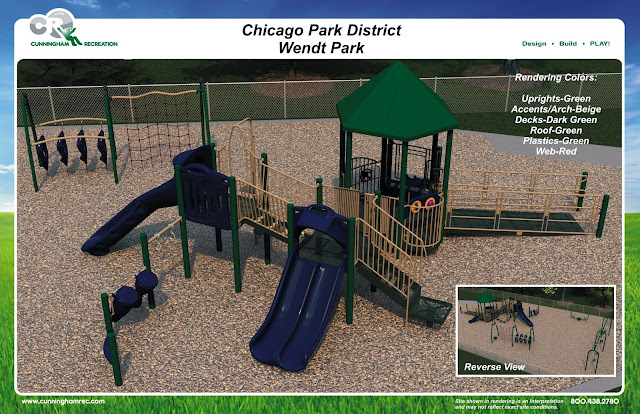 During one of our normal meetings the alderman's assistant, who regularly attends BHN meetings, mentioned to the board members if we would be interested in a 'freebie' from the Chicago Park District. 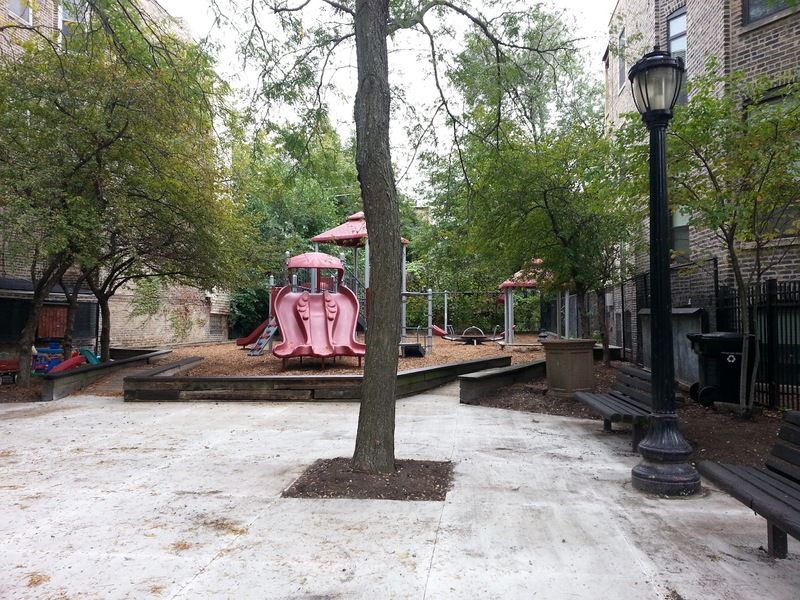 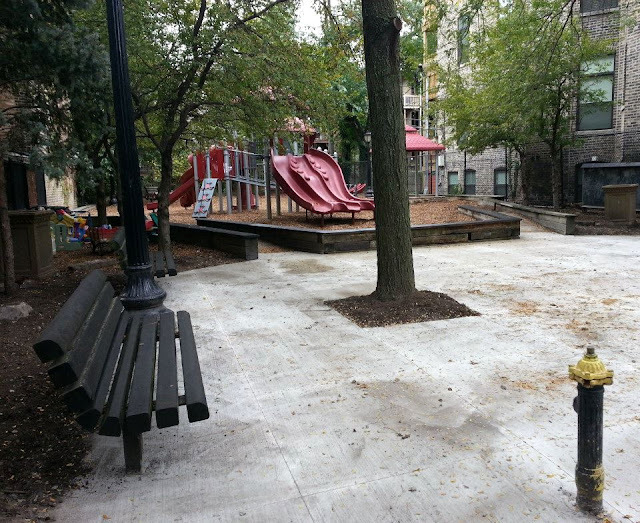 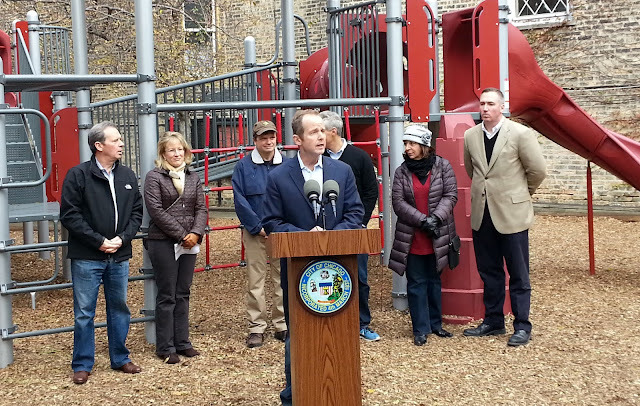 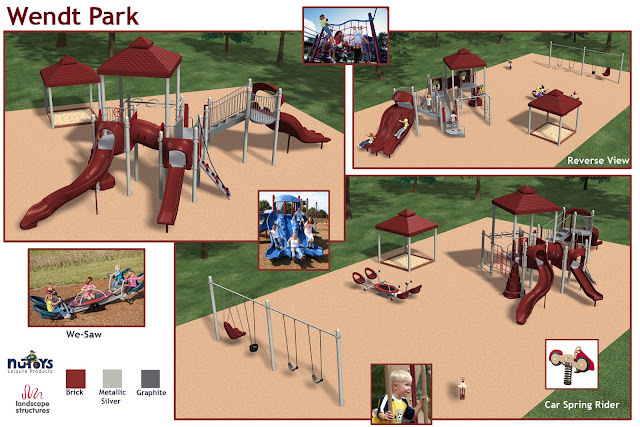 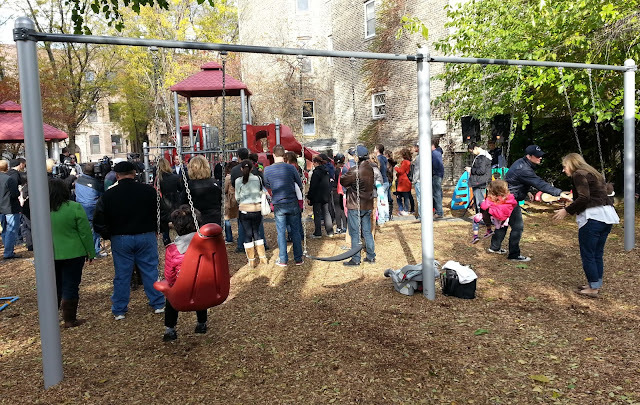 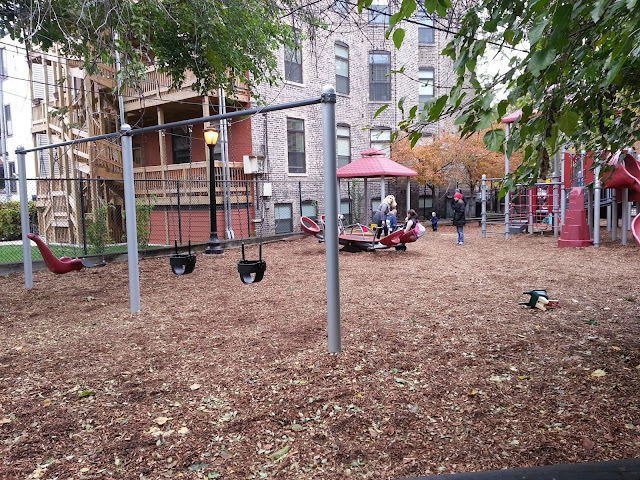 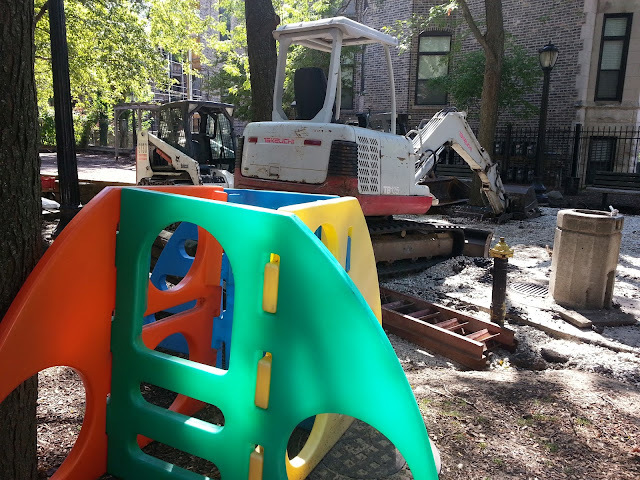 The district offered new equipment for any park or playlot within our geographically location. 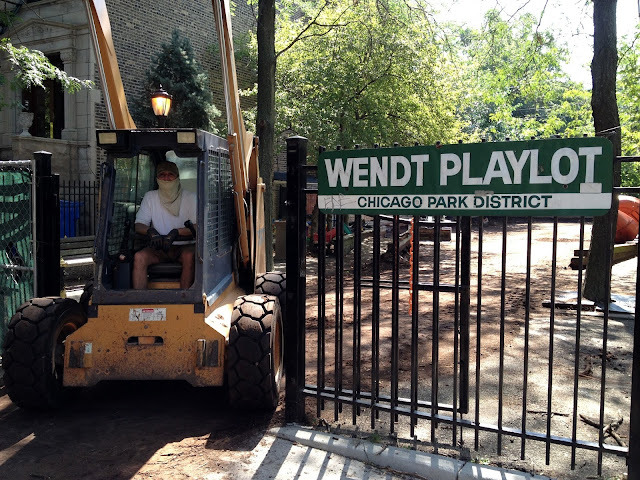 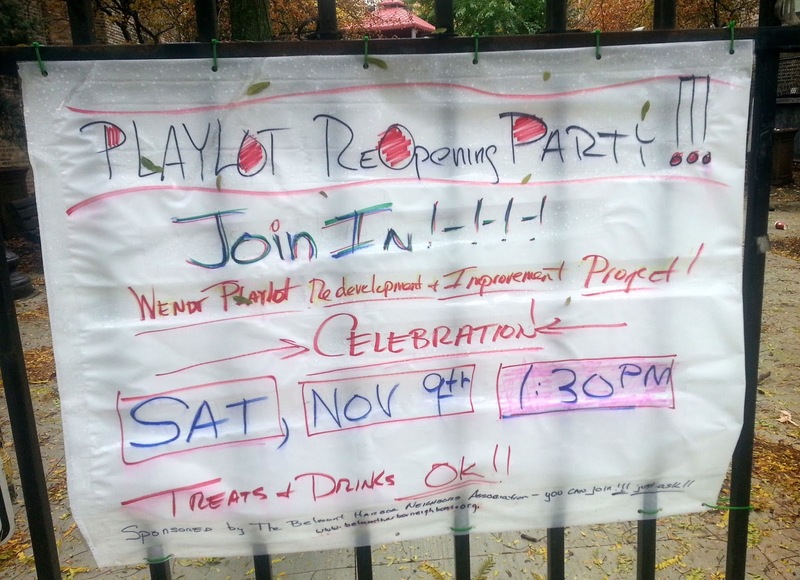 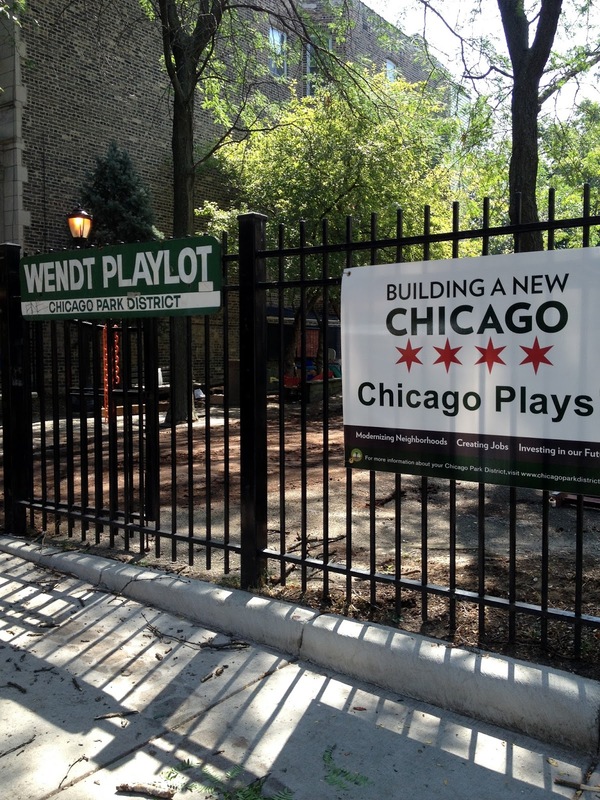 BHN only as one - Wendt Playlot that was first dedicated in 1992. 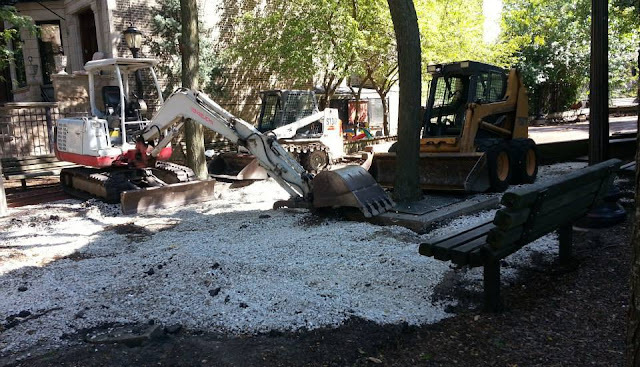 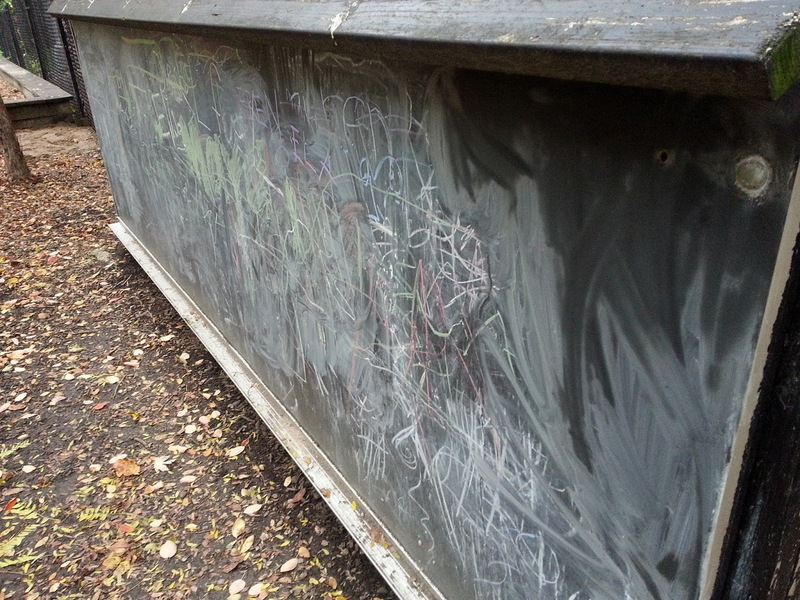 After several months of playing by the BHN secretary, alderman, park district and other members of the BHN board the old equipment was removed and new installed along with new ground covering. The last weekend before the re-dedication ceremony was to buy and plant scubs for the new space by the board members of BHN. 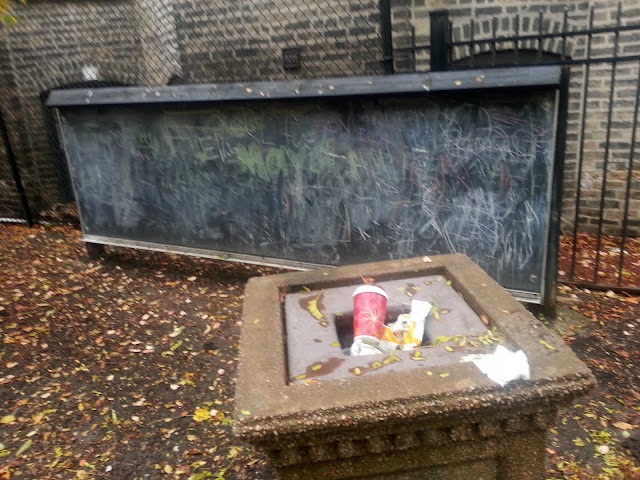 The pictures below tell the story. 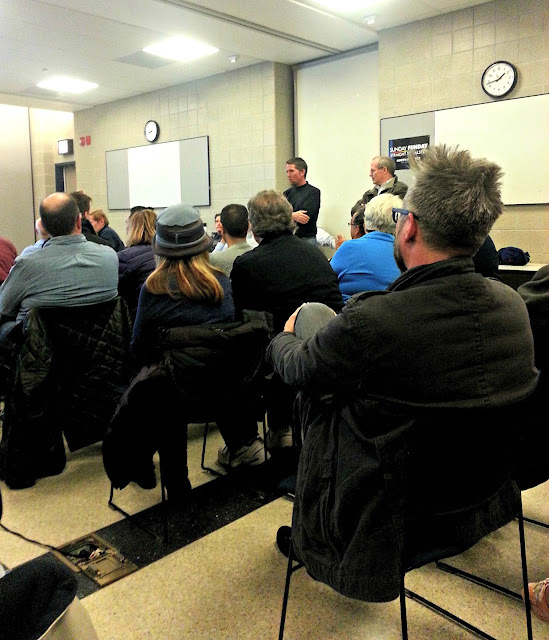 Pics below were taken by me - Garry Albrecht, Communcations Chair of BHN. 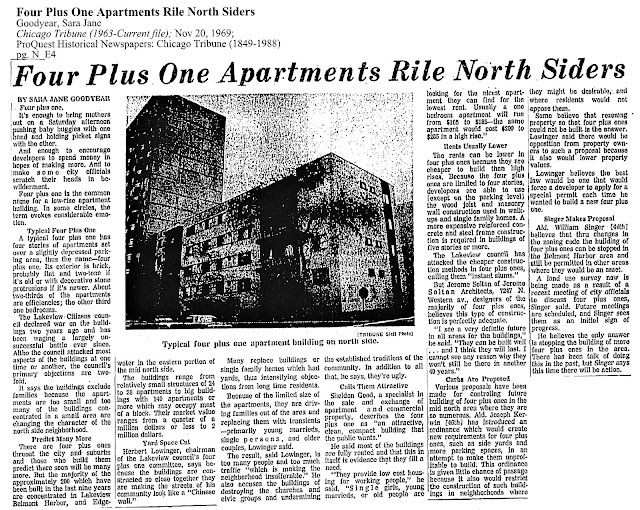 The Chicago Out Hotel was to be located between Buckingham and Roscoe in the heart of Boystown. 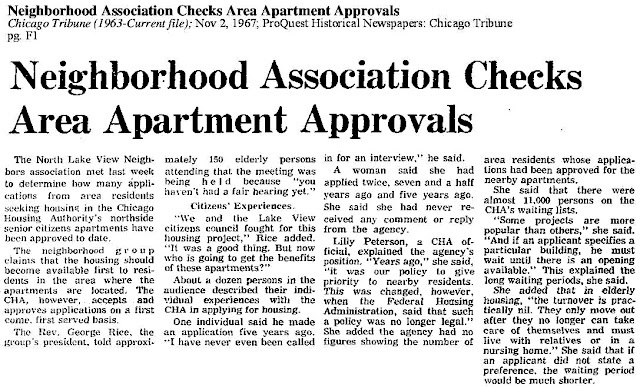 This hotel was billed as the 'straight friendly' hotel on Halsted Street. This planned development pitted the business owners of the Halsted strip with the residents who lived east of it, particularly the homeowners across the narrow alley - an alley used to gain access to homeowners' garages. 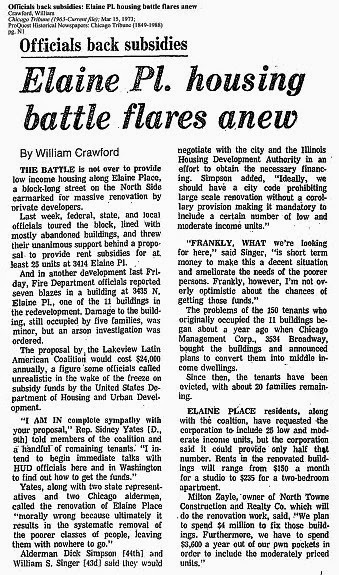 There were several articles published by DNAinfo on this subject - look under the sub-reference Boystown for the articles. This issue played a major part in a dissolution of the neighborhood association after 40 years of existence. 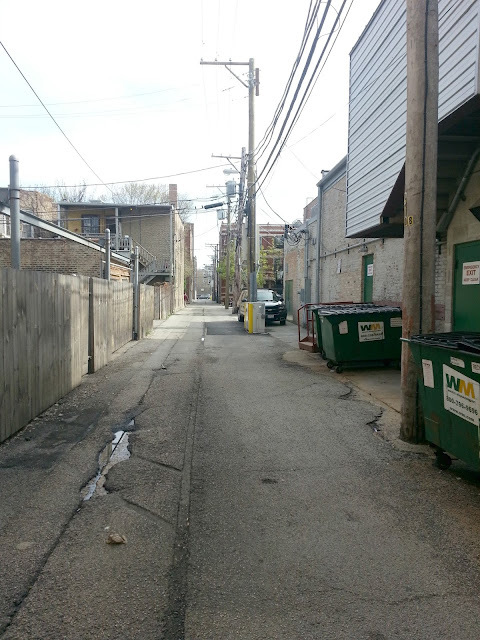 Below are photos related to the alley and buildings that played part in associations' decision not to voted for the construction of the hotel within the associations local geographical area of responsibility. 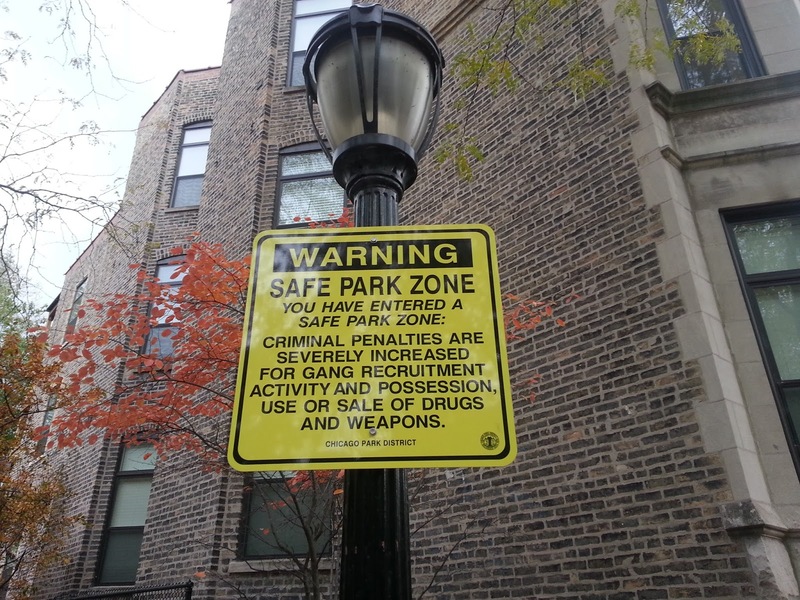 Typically, the alderman will adhere to the associations decision. 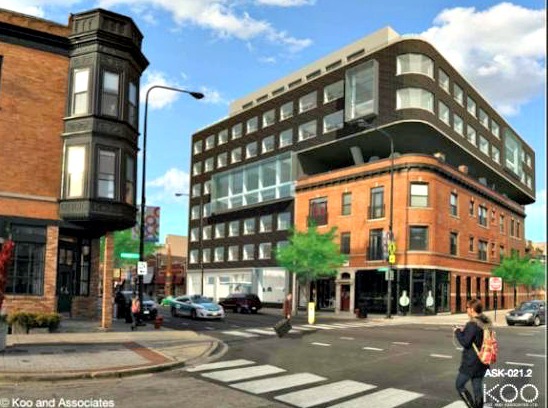 The alderman who was not fond of the hotel idea at this location voted no as well. as the centerpiece of the planned development proposal. 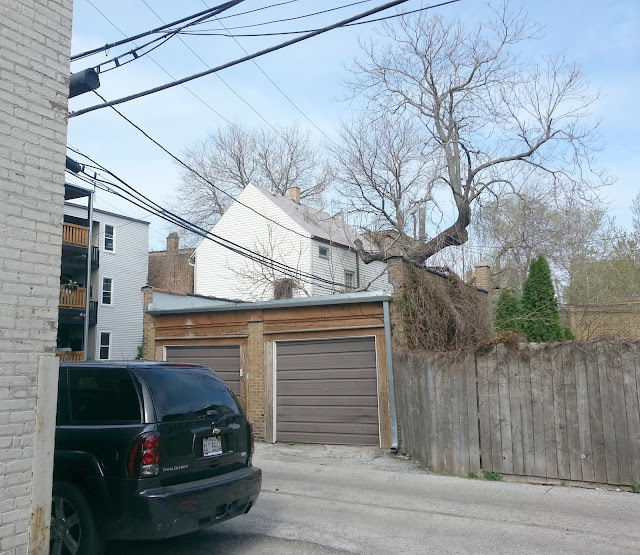 The developer bought this property without surveying community support from non-business interests. 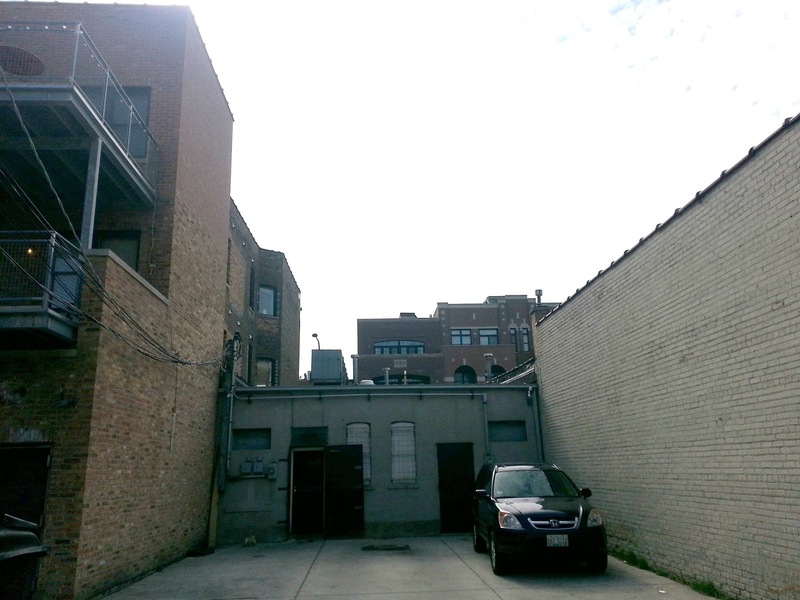 a 'shadow meeting' was held at SideTracks Bar with some of the residents that were directly affected by lack of sunlight to their properties due to the height of the building - a rezoning issue that only the alderman could grant. View a map of communities, neighborhood associations, and Block Clubs in Chicago per Google maps - not a complete & comprehensive map but it's something. They are not any registered 'block clubs' in Lake View as of 2016 unlike in Uptown and Edgewater. 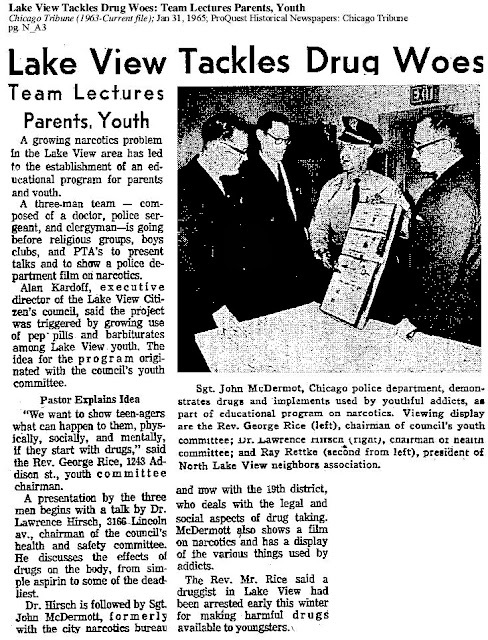 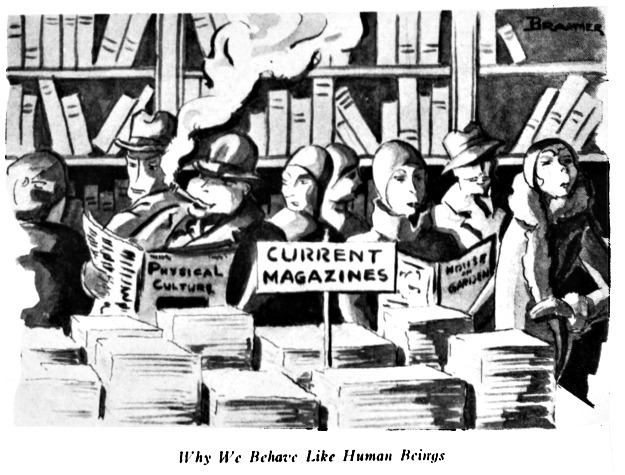 Also, listen and view a civic educational film about how to be a 'good citizen' as of 1949, an idealist view.